Fishing Report September 30, 2012 Jeff Sundin - Here we go, winding our way out of another September. The good news? It's only 335 days until next September and the time in between is gonna fly by! Fishing on Leech Lake during the fall is always fun, but when you've got great weather, great friends and great fishing all at the same time, it's getting pretty close to being heavenly. On Saturday, I got to help Mike Carlson spend his visit home from California, by helping him catch his his personal best Walleye. The 28 incher came after dark, trolling crankbaits on Leech Lake. Calm, sunny skies and summer-like temperatures were hardly what you'd think would cause a hot bite, but I guess that the Walleyes must have been out of the loop when the memos were distributed. Not only did we have great weather, the daytime action was actually better than the night bite, at least for us. For me, working the sceond shift on Leech Lake is great fun, but it took us into the wee hours and I stole a little extra sleep for myself this morning. I'll have the whole report, along with the report from today's trip, first thing next month! Ha! See You! Fishing Report September 29, 2012 Jeff Sundin - Can I please ask for a favor? If you would just take a minute and browse through my comments from yesterday morning, it would really help me out. You see, I'm not the type that likes to say, "I Told You". But some of the scenarios that I talked about yesterday, played out almost too perfectly, almost right down to the minute. If you can spare a few moments to review, then I won't have to say .....you know, those three words. Whew! Thank you! We talked about it all day long in the boat. There's some kind of magic that happens during certain moon phases of every year. Sometimes, it works in strange ways though and to really take advantage of it, you need to be flexible enough to roll with the weather pattern. For me, rolling with the weather didn't work out on Friday, but today is a new day and hopefully our timing is going to be more suitable this time. On Friday, it was the fourth and final day of fishing with Kyle and Karen Reynolds. If you were curious about how the three of us were going to try take advantage of that big, gorgeous Full Moon, here goes. Walleye fishing? No we already had them packed and frozen. Northern Pike? No we already had them packed and frozen. Sunfish? No we already had them packed and frozen. Perch? No Karen doesn't really care for Perch. Okay then what? On this particular day, I had myself painted into a really weird corner. 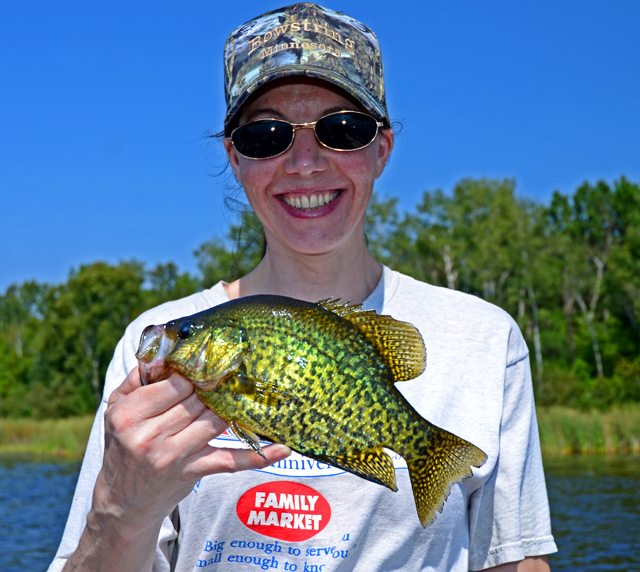 For the first time in many years, I was sitting in a boat, in September, knowing that all I needed to try and catch was a crummy limit of Crappies. And ... for one reason or another, I just couldn't do it. There are lots of reasons why, but the most important one of all, is that I just plain need to break some old habits. 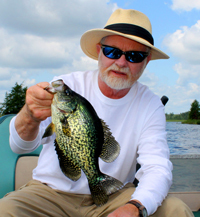 Part of the trouble is the unbelievably heavy traffic on the "old reliable" Crappie spots, everybody knows 'em all now and except for the days when no one else gets there first, it's hard to find a school of fish that hasn't been worked already. Another part of the trouble is the abundance of extra small size Crappies, they're easy to find, and catchable, but way too small to be interesting. Finally, in my case, my own bad timing has been part of it too. Searching for new, fresh water and either showing up at the right place, but the wrong time or sometimes, the wrong place at the right time. Anyway, all excuses aside, we did manage to get some Crappies, but not the number or the size that we've enjoyed in recent years. If I would have been on a different mission, my particular story might have been better. No matter though, there are plenty of fantastic stories to go around, most of them having to do with Trophies, quality vs. quantity. The news about trophy Walleye fishing was coming from everywhere during the evening. At about 8:00 PM, I talked on the phone with one friend for 5 about minutes while he was fishing on Leech Lake. During that time, his crew caught a 26 inch and a 29 inch Walleye. Yes, just during the conversation! Then, I got some pictures from another, who was over on Cass Lake. Their fish weren't as big, but they were nice enough and they were biting too. The same thing was happening on the West side of Lake Winnibigosh. The pattern is usually reliable and this year, the weather couldn't be better. If you've been thinking about catching your own CPR Walleyes, then take a run at the night bite. All you need is decent trolling rod, almost anything will work, but if you have a 7 to 8 foot casting rod with a light tip, that's perfect. A line counter reel makes the job a lot easier, but again, it's really not the only way to do it. You'll be trolling in shallow water, 5 to 8 feet and using shallow running crankbaits. A Shadling, Wally Diver or almost any shallow running crankbait that runs true at speeds of 1.5 to 2.0 MPH will do the trick. Half the fun of trolling after dark is experimenting with the baits. Don't worry, get yourself into any decent water at all, and you'll know when you have found the right combination! There are guys out there who do this a lot more than I do. So if you want more details, let me know and I'll put together a list of more specific recommendations. About the Fall Turnover; There may be a few lakes that did "Turn Over" during our recent cold snap. Most of the lakes in our area have not turned over yet, but are on the verge of doing it. Signals to watch for are; Musty smelling water, balls of floating green or brown organic material and water temperatures below 54 degrees. Fishing on a lake that has just turned over can be tough to say the least. There are ways around it though, Deep water lakes turn later than shallow ones. If you think your favorite shallow lake has already turned, try a deeper one. Some lakes do not "Thurn Over", springs and underwater current keep deep water in some lakes Oxygenated all summer long. Lakes that have a reputaion for deep water walleye. like Cass, Pike Bay, Walker Bay, Ten Mile and others like these, may be a good choice at this time of the season. Finally, Rivers never turn over, so when you're really stumped, try the moving water of the Mississippi River. Fall is one of the absolute best times too fish the river. Fishing Report September 28, 2012 Jeff Sundin - Well, I'd rather have had September last a lot longer than it has; But if we have to let it go, then winding it down during the Harvest Moon could be a pretty cool way to do it.The Full Moon of September triggers all kinds of fish and game movements and I know a lot of folks who plan on trying to take advantage of it this weekend. Deer hunters and Huntresses armed with strings and sticks, will be out in force this weekend and I'll bet that there are gonna be some real trophies spotted on the trails this evening. No matter whether you're gonna be fishing or hunting though, keep in mind that the heavy night time feeding patterns can sometimes lead to slow mornings. It's a little tricky to catch something in the morning while they still have bellies full of food from their midnight snacks. You might be surprised to find that some of your best action occurs during mid day. If you're gonna miss out on anything, plan on missing the mornings and hitting it hard during the evening, right up to the last glimmer of daylight. For some of my fishing buddies, fishing during the Harvest Moon doesn't even start until after dark. No, they don't catch too many eaters. 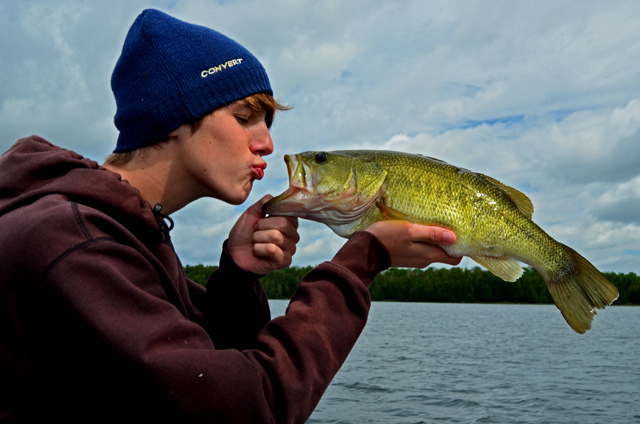 But fishing on lakes like Leech, Cass, Pokegama and Lake Winnie, will produce dozens of lunker size fish for the anglers with CPR on their minds. I will have some especially anxious trophy hunters on Saturday and I'm planning to dig out the Lindy Rigging rods. I'm gonna have a bucket full of whopper size minnows and hopefully, the fall big fish patterns that have worked in the past, will give us a thrill or two this weekend. Fishing Report September 27, 2012 Jeff Sundin - Okay, it's not like we've never had a nice day before, but I can tell you one thing. Fishing with Karen and Kyle Reynolds conjures up memories of being on the lake during the rain, the snow, the wind ... you name it! I promise, if anyone has ever earned a few nice days on the lake, it's them and it looks like this time, their timing has been just about perfect! On Wednesday, we started with Crappie fishing. I hit another small lake, hoping that we'd find a nice mess of hungry varmints to give us a good head start. We found 'em alright, but it was another one of those good news, bad news scenarios. Easy to spot, easy to catch, but way too short to do us any good. There were a handful of keepers, but most were below the threshold and after a brief side mission for Pike, we went ahead and blazed a trail to another lake. On this particular lake, the surface temperature had dipped below 54 degrees and there was a lot of debris in the water. I'm not certain, but I was really suspicious that I'd managed to hit this lake in the midst of the fall turnover. It seemed way too easy to mark schools of fish and it was way too hard to get the keepers to bite. Just in case I'm right, it would be a good idea to start avoiding shallower, dark water lakes. They'll be the first to turn, so spend some time on the deeper lakes that hold their temperatures. By the time the deeper waters churn and turn over, then some of the shallower lakes will have already recovered and you can return to them for round two. At our second stop, things were a little more interesting. As we arrived, it looked like we may have had a struggle, a lot of days like this would have been. The glassy surface and bright sunshine didn't remind me of an outstanding Walleye day, but somehow, it worked out to be good. Surface temperatures here were what I'd call ideal for this time of year, they ranged from 57.5 to 58.5 degrees. There was still an algae bloom in the water, it was green, but not soupy looking. The algae stained water was likely one reason that the fish were still active in spite of bright skies. We did have to stay closer to the heavy weeds, but using a jig and minnow in 8 to 10 feet of water, produced plenty of strikes, and in spite of our propensity for missing opportunities, there were enough solid bites to get us into double digits. This is the third Walleye lake I've fished in the past 5 days and all of them have produced desirable results. 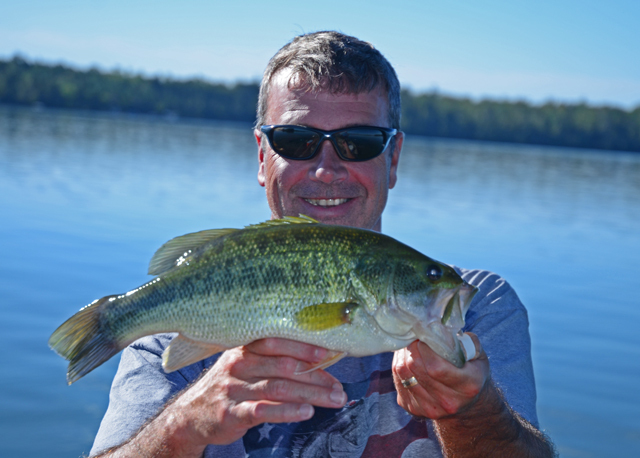 If you've been frustrated by a lack of action on Lake Winnie or on Leech Lake. It might be a good time to revisit your list of the lakes you've always wanted to try. Knowing that the fish are likely to be hungry right now, should give you confidence that when you find a lake with a good balance of fish vs. baitfish, you'll be able to catch 'em good. Fishing Report September 26, 2012 Jeff Sundin - Enjoying a nice, "Sunny" day on the lake! Whether it was planned or not, the Sunfish action we enjoyed on Tuesday afternoon was out of this world! If you're a regular reader, then you'll already know that I do my best not to exaggerate or embellish the stories, I just tell it like it is. Trust me, just this one time, in nearly 30 years of guiding, I can honestly say that this day was one of the top 5 Bluegill days I've ever experienced. It didn't start out that way, it wasn't part of the master plan, but the helping arm that led me to the sweet spot .... Well let's just say; "You outdid yourself this time"! Knowing that I have 4 days of fishing with Karen and Kyle Reynolds, there wasn't any reason to force ourselves into any particular game plan. With Crappies on my mind, we headed for a fresh lake, hoping that it would pay off. The morning was absolutely gorgeous on the little lake. When we arrived, a dense fog covered the lake. Surface water at 58.5 degrees was warmer than most of the lakes I've visited lately. The small, deep water lake has been holding it's heat better than some of the shallow ones and was encouraging the heavy fog. There wasn't a ripple on the surface either, it was shiny smooth like a mirror and reflected all sorts of interesting shapes and colors. One of these days, I'll be able to take a picture that does that scene justice, but for now, I did my best with what I had to work with. As pretty as it was out there, the panfish were in a funk. A particularly bad funk, like I mean it was impossible to get them to bite. 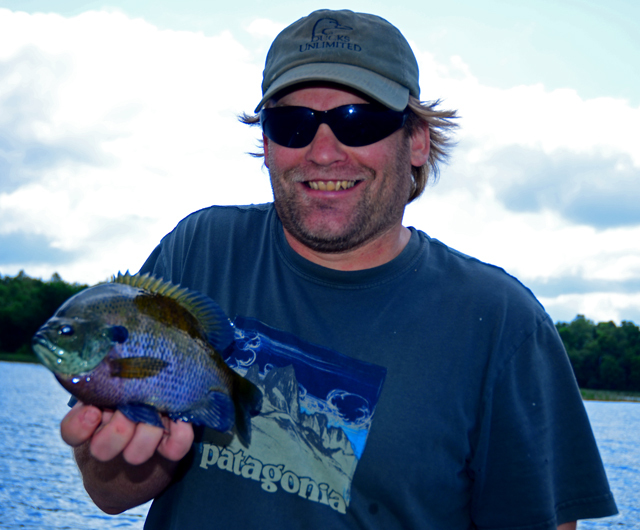 They were easy to find, many small packs of panfish were holding on the outer edges of the break into deep water. The Humminbird showed me lots of fish in the 15 to 25 foot range, but watching the jig on my screen as it dropped toward the schools of fish, I knew there was trouble when I couldn't even entice them to rise up for a look. I moved onto the shallow breakline, where we cast small jigs tipped with 2 inch Ripple Shads. At least now we had some action, Northern Pike were stacked up all along the base of Bulrushes which line most of the lakes shoreline. They were active, too active and the were snipping the jigs off of the light line one after another. If they'd have been a little larger, I would have re-tooled and stuck with them for a while, but except for one fish that measured about 24 inches, the others were below the threshold of making it an interesting fishing experience. So, on the trailer and down the road we went, renewed enthusiasm and high hopes kept us in good spirits. At lake number two, the water was also warmer than average. At 57 degrees, it was still in prime fish catching territory, I thought. Here too, the water was calm, but there were a few clouds moving our way and a light breeze kicked in and out of gear. Like the first lake, finding schools of deeper fish wasn't too hard. There were packs of fish anywhere from 20 to 35 feet, some of them did bite, but they were too small to help. I love Crappies, but 5 inches just isn't going to work out. I kept poking around, checking different depths, some weeds, some rocks and every so often, we'd pick up a couple of fish. 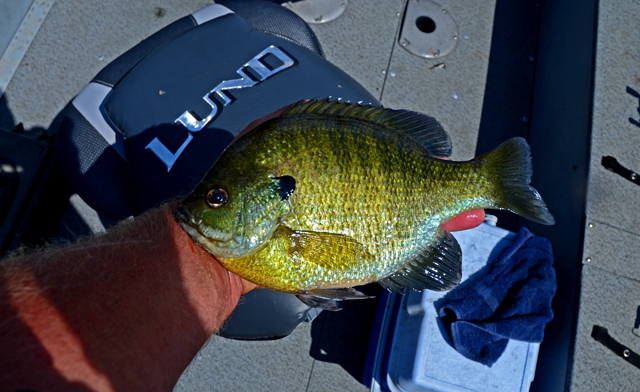 It didn't take long to realize that the Sunfish we'd stumble into, were larger than the Crappies and the idea to switch was beginning to take hold. I turned to my right and said something like; "Ya know, this is one of those times when I could use a lucky break". Well okay then, lucky break, coming right up. I headed to a rock hump that usually has something on it. Bass, Pike, Walleye, whatever ... we really didn't care. I asked K & K to cast some more of the small shads while I experimented with a small jig and piece of cut worm. Let's see, how can I say this without offending anyone? Hole EEE ....! Before they each had made their second casts, I already had boated three sunfish. The last words I had time to remember were; "Put away the casting rods and get out the panfish gear, let's see if there are some more down there". Down there? Yes, there were, lots of them and they were plenty hungry. In fact, we had a four hour run of non-stop action, never a moment with a fish coming in and sometimes, all three of us were reeling at the same time. The fish couldn't have been more perfect or come at a better time. There were a handful, of 10 inch fish, but not enough to claim this as a trophy lake. The average fish were nice, but not giants. Once we realized how strong the bite was, we tried to keep fish that were between 8-1/2 and 9 inches. Perfect for eating and a blast to catch. The presentation was interesting, we used a 1/16 ounce Perch Eye Jig. At first, we tipped them with cut pieces of Night Crawler, but soon switched over to those small baits that come in a jar, you know, the ones that fish sometimes gulp down? The artificial Wax Worm and the tiny, 1 inch minnow were both very effective. The fish were holding on the tips of the hump in 10 to 15 feet of water. If you imagine a triangle, all three points had fish on them and we simply moved from one to another as the action faded. Okay, so that was a little bit of bragging, but you know that If I have a bad day, you'll be hearing about that too! So I appreciate you putting up with me this morning. Oh by the way, Thank You ... and :)!! One last moment of bragging and then it will be out of my system for a good long while. A press release from Lund Boats came through this morning and there was a big grin on my face when I realized that the photo they used, just happened to be a picture of my daughter and I. Everyone knows that they wouldn't need a picture of me, but they love Katie, so if I go along, at least I get to be seen with her once in a while! Check out the release below. If you pick up a copy of the 2013 catalog, I'm sure that I can get Katie to autograph it for you! (9/26) Bemidji Lakes Area, Paul A. Nelson, Bemidji Area Lakes Guide Service says; "The September full moon is often the best full moon period of the year for anglers wanting to catch big walleyes. The actual full moon is this Saturday, September 29th, but anglers should also have good fishing at night several days before and several days after the full moon. The best lakes for night fishing walleyes are usually clear water lakes with a reputation for producing big walleyes. Lakes like Leech, Cass and Bemidji are all good choices for walleyes at night. Trolling floating minnow baits is the most common presentation at night, but anglers can also fish lighted bobbers with live bait like leeches or larger minnows. Many anglers fishing bobber rigs prefer to fish on shallow rocks at night, while anglers trolling minnow boats usually like the edges of larger bars in 8 to 12 feet of water. The ideal locations often have long stretch of productive water with an easy breakline to follow and few snags or tall weeds to foul the lures. Most anglers troll forward at night at speeds between 1.5 and 2.5 mph. A long rod with a line counter reel spooled with 8 or 10 pound test braided line and tipped with an 8 to 10 pound test fluorocarbon leader is usually perfect for trolling at night. Anglers have also been catching walleyes on jigs and minnows or on live bait rigs with leeches, night crawlers or larger minnows. Anglers on lakes like Bemidji and Cass have been fishing in 18 to 24 feet of water, while anglers on Leech and Winnie have been fishing in 8 to 14 feet for walleyes. Fishing Report September 25, 2012 Jeff Sundin - On Monday, a date which would have been occupied by the Finch's, but left open due to an illness, was covered instead by my old Pals Steve Shears and Kim Masterson. Their pal Scott rounded out the crew and we all hopped in the truck and headed toward a warm, breezy day of fishing. It seemed like a great day to try one of my famous two lake specials, first we'd try to bag some Walleyes and then we could shift into Crappie gear in the late afternoon. It was a great plan, sort of. When we arrived at the landing, there was already a stiff breeze blowing and on the lake, whitecaps were rolling toward the East side of the lake. Surface temperature was unchanged from my last visit, 54.5 degrees at the start, inching up to about 55 degrees by days end. Our first stop, a fairly large Cabbage patch that offered the correct angle for drifting. The wind was too strong for this spot, even with the Drift Sock, were were moving at 1.4 MPH. Still, the speedy drift yielded a few Walleyes, a couple of Northern Pike and a Smallmouth Bass. We were off to a decent start, but I needed to get a better handle on my boat control, so we headed toward some calmer water. A pair of shallow rock humps that topped off at about 10 feet gave us a few more grins. Here we caught a keeper Walleye, a few nice Smallmouth Bass, plus some Northern Pike. The action was good, but we weren't getting many fish for the neighborhood fish fry, so off we went again. For the rest of the day, each stop seemed a little better than the one before. As we progressed, a definite pattern emerged, and as we perfected the plan of attack, the fishing got easier. West facing, shoreline points that contained mixed rock and weeds were holding small, but active schools of fish. All of them, every single point we stopped at, there was always least a few fish. Sometime we could get a couple of passes before the action fizzled, sometimes even three or four. But one thing all of the locations had in common; There was never a massive school of fish, not any one place where we could have spent the whole day. It was a good geography test for me, and it was good for the crew too, because each time we moved, a flurry of action would perk up everyone's interest. Of course, some of the guys were perkier than others; Let's just say that it was a really great day to be Steve! Our presentation was as simple as it gets, 1/8 ounce jigs tipped with medium to large size Rainbow Chubs. Fishing the outer edges of the weeds in 8 to 11 feet of water, paying particular attention to areas of rock with any significant weed growth close by. Using the drift control to steady the bow, I kept the "Opti" facing into the wind, letting the Wave Wackers work their magic. The controlled drift was perfect. Boat speeds of .5 to .7 MPH allowed plenty of time for everyone, especially Steve, to work their jigs on the shallow structures. Now, at about 3 PM, I called a special meeting of the fishing committee and after a brief discussion, we decided to go on a little adventure. We though finding a new lake to catch Crappies on would be a great idea, so we headed for the landing. We took an especially scenic tour, well off of the grid, into the back woods. Surely, we were on our way to Crappie Nirvana, we'd have the whole lake to ourselves, all we had to do was find the landing and slip the boat into the ..... WHAT? YOU HAVE GOT TO BE KIDDING! After a half our drive into the middle of nowhere, we arrived at the landing, only to find a giant crane, sitting on the ramp, moving the concrete pads. Of all the times that anyone could choose to replace that boat ramp, I just happened to pick the day that they were in the middle of working on it. So there we were, all dressed up and nowhere to go. We didn't have many choices, by now it was late afternoon and anywhere we could think of, was a long drive from there. We did manage to get onto Little Cutfoot and we even managed to catch some small Crappies, but honestly, all that did was prove the point of why I was looking for new water in the first place. So, there ya go then, mostly a great fishing day, with a little misadventure thrown in to spice things up a little. Fishing Report September 24, 2012 Jeff Sundin - Sunday was one of those fall days that only comes along about a half dozen times each year. Yes, it was chilly in the morning, but the bright sunshine, calm breeze and active fish combined to make the day almost too easy. Fishing with Jim and Jan Bopp isn't too complicated to begin with. Walleyes, Perch, Crappies ... whatever we can drum up is usually a good game plan, so we headed to multi-species central, Sand Lake. At the landing, I spotted my first surface temperature reading below 55 degrees this season. Heading into Little Sand we found a surface temp of only 54.6 degrees and on the big lake, 56.0 degrees, just barely. So far, there wasn't any sign of a full blown "Lake Turnover", but there was a certain amount of pucker factor for me, as we began fishing in the colder water. It was an odd day: It was easy fishing in that, if I could see them on the Humminbird, we could get them to strike. Odd because they were scattered all over the lake. Almost everywhere we stopped, we'd have two, maybe three fish almost immediately, followed by a sudden slow down. There were a couple of exceptions, but the rule for the day was to just keep moving. Putting my best foot forward as we moved from spot to spot, watching the electronics and believing the signals! For Walleyes, our best spot was a point on the upwind side of a weedy flat. Fishing in 10 feet of water, just skirting the outer edge of the weeds, we caught fish on three or four drifts in a row. Jig and minnow combinations are all we used, so I can't compare them to other presentations. But it's fair to say that if you come armed with 1/8 ounce jigs and a bucket full of 3 to 4 inch Rainbows, Fatheads or Shiners, you will catch some fish. Walleyes weren't all on the weed edges though, we also caught a few of them in the 18 to 22 foot range at the deeper edges of the same mid lake bars where fish have been located all summer. In the deeper water, a hodge podge of fish were scattered all over the place. We didn't find any giant schools of fish, but small packs showed up all over the place. 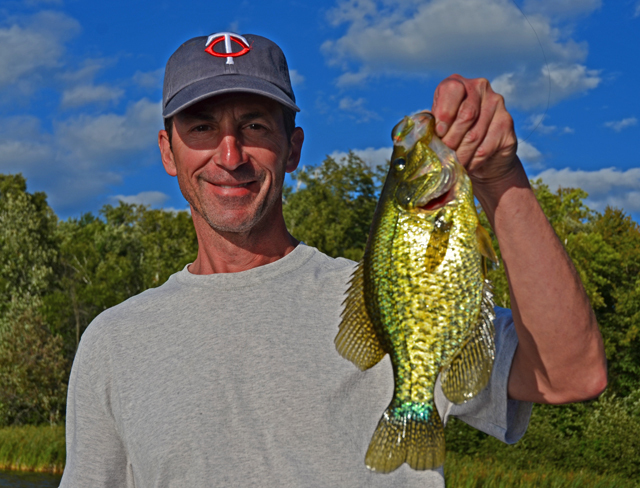 It was like fishing for odds and ends; A couple of Crappies, some small Walleyes, a few Perch and even some Rock Bass. Every bite came as it's own little surprise. Perch fish always winds up on our agenda eventually, and the only really serious effort for jumbos was our visit to a patch of Cabbage weeds. Fishing in 8 to 9 feet of water, we were able to pick off a dozen Perch. Good size fish, but not super aggressive. A full day of hunting and pecking in the weeds could be interesting though, and it wouldn't surprise me to pick up a handful of Walleyes during the search. (9/24) On The Iron Range, From Greg Clusiau; "The skies looked awful but like normal, I pushed it to the limit, staying too long, and barely made it back to the access in time. As a matter-of-fact, heading back to the landing, at full throttle, I could feel the front of the boat lifting up from a gale-force wind. Once loaded up, I headed ... " ... >> Read Greg's Full Report . 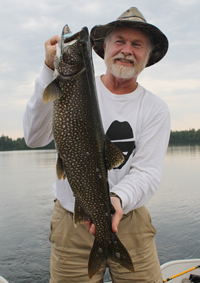 (9/24) On Lake of the Woods, Border View Lodge, Mike Kinsella wrote; "This week brought a strong weather pattern of wind from the north which kept most anglers in the river. The good news is the Rainy River is in the beginning stages of showing its fall legacy! We have had some good fishing in the river this week. It is still not into full swing by any means but there were some big fish caught and released with some to eat and many little ones. We are starting to see more shiners in the river as the temp is steadily dropping. Yesterday we had a near state record Quillback caught. With much anticipation, it went on to the scale. Only to show it was just short of the 7.5 pound current mark. Strangest part, nobody even took a picture! Right now the forecast for this week shows favorable, with highs hitting the 60’s and lows to 30 overnights. We are also hoping the wind forecast holds out as it should be sunny and light for the week ahead. Current water temperature in the river is 54.1. Fall dates are booking in quickly, if you plan to get in a last trip of the season you may need to decide sooner than normal. Winter rates are posted; it’s time to book your winter trip".- FISH ON! (926) New York Mills, Minnesota - Take note of a frequent-flyer ‘exit row’ occupant settling into the seat of an airliner boasting a few extra inches of leg room, and you’ll immediately sense their appreciation of the added space – all stretched out and visibly relaxed. 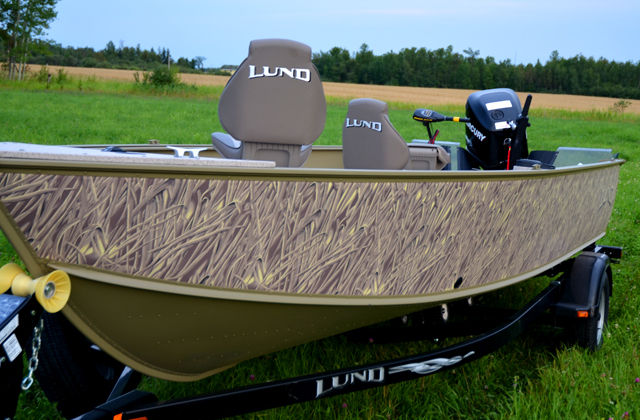 Now imagine, if you will, an avid angler sitting within the sturdy aluminum hull of a LUND Rebel XL that’s 3-inches longer, yet offers 7 more inches of cockpit area due to its already ultra-wide stature. The three inches in length, combined with the redesigned console and layout, provides for an amazing seven more inches of space in the cockpit area. To say carrying out the functions of fishing with more elbow room alongside the burliest of buddies is, to state the obvious. If your dream of relaxing within the wide-open spaces of a fishing-friendly vessel is pleasing, then LUND’s 2013 1650 Rebel XL is the craft the cramped boater has been looking for. This 16-foot, 6-inch boat boasts an 84-inch beam and more compartment space than ever before – including a dual level rod locker with protective divider tubes for 8-foot rods, a large livewell, and a bow deep-cycle battery compartment. Those features, and all storage areas, are easy to access with updated, oversized doors. The larger-than-ever Rebel XL fishes like a boat twice its size, and it is able to withstand the swells of big bodies of water, yet it can be launched easily on the unimproved ramps of smaller lakes. Additionally, the 1650 Rebel XL is stable whether stationary or on the fly. The improved design also allows anglers to skim the surface with increased horsepower; the 1650 SS and Sport models are now rated to handle a commanding 90HP outboard; and the tiller with a 60HP motor. 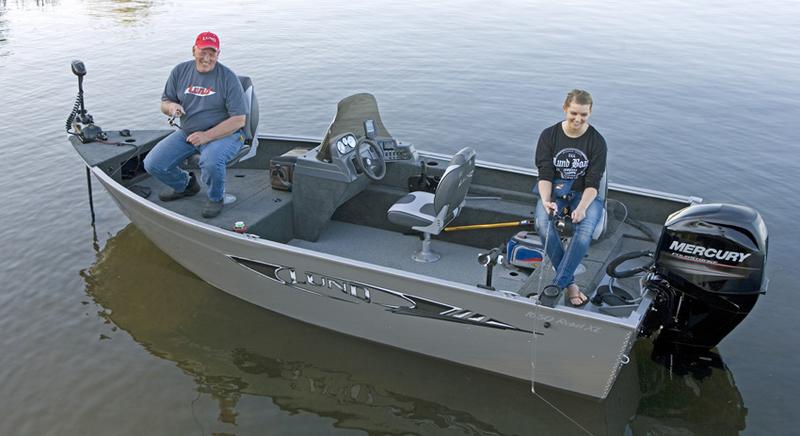 Adding to the fishability of LUND’s new Rebel XL series is an innovative multi-base seat option in the bow, as well as an aft platform, with optional aft jump seat, redesigned to offer a single level of footing across the entire back casting platform. The 1650 Rebel XL will be the sharpest looking rig on any waterway, too, with LUND’s optional sporty two-tone paint selection. Last but not least, the redesigned console and optional boarding ladder lend even more upside to the iconic craft. - Larger. Faster. Superior. LUND’s affordable new 1650 Rebel XL has it all! September 24 , 2012 - On Lake Winnie, there are still a lot of fish on the deeper, main lake bars. Windy conditions have forced a temporary shift way from the bars, but once conditions calm down, look at the Bena Bar, Horseshoe Bar and Moses Bar. Lindy Rigs tipped with Night Crawlers, Creek Chubs or Redtails will be a reliable presentation. During fall, don't be afraid to try jig and minnow combos on the bars either. This is a good way to catch a mixed bag of Pike, Walleye and Perch. 1/4 to 3/8 ounce jigs tipped with a good size Fathead, Rainbow or Shiner will do the trick. 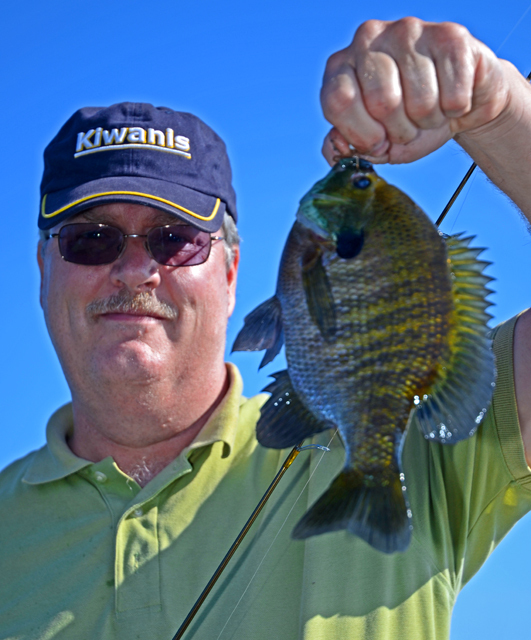 Schools of Crappie and Sunfish are easily located in open water now. 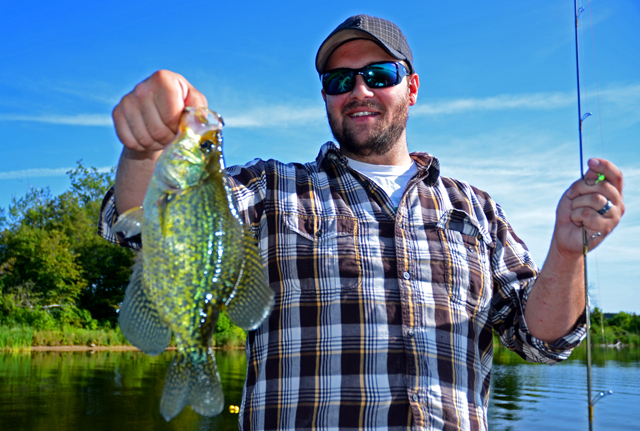 Roaming packs of panfish are in 18 to 16 feet of water, usually suspended. 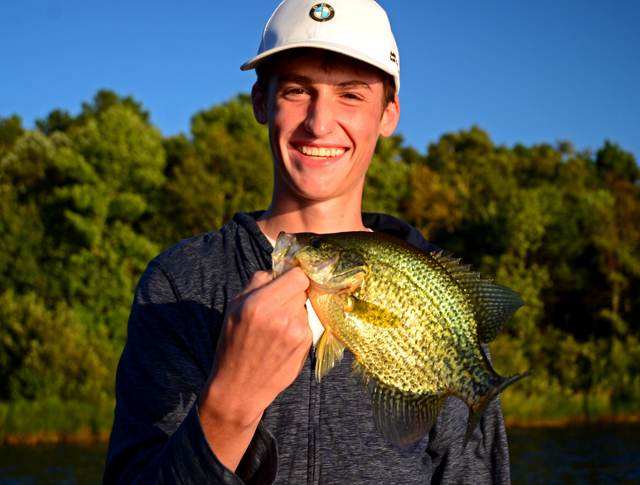 Well fed and heavily pursued, the heavily pursued panfish have been tricky to catch, but if you ... Read >> Bowen Lodge fishing report . 10-1-12 Attention Lodge Owners, Rental Operators and fishing guides, it's time to update the fishing reports page! Email your update or inquire about advertising here. Fishing Report September 23, 2012 Jeff Sundin - It was one of those days that you hope doesn't happen, but it happened on Saturday. A medical emergency forced my crew to bail out of Minnesota and head for home. Hopefully, the condition will pass, his health will improve and we'll get a re-match. I'm waiting for a status report in the near future. Get well soon Skip! The sudden cancellation of our trip resulted in most of a day off of the water for me. So somewhere in between day dreaming and resting, I did my my best to get caught up on a few chores. By late afternoon, I started pacing back and forth, feeling like a caged Lion. Sensing that I just needed a whiff of good air, I began scratching my head for some ideas. Lately, I've had the notion that I wanted to try some different lakes this fall for Crappies. I remembered a recent reminder about one of the small Crappie lakes not too far away from the house. It's been a while since I'd fished in open water there and I recalled that there was a nice Crappie spot, really close to the boat landing. It would be about as easy as it gets, out of the wind, out of the cold and I could fish the whole lake in a few hours. I headed that way and when I circled into the landing, there wasn't a soul in sight, I had the whole lake to myself. The surface temperature was consistent everywhere at 56.8 degrees and it was choppy, the brisk North wind even had this little lake stirred up, but not enough to cause trouble fishing. I expected to spend a while trying to locate a school of fish before I could wet a line. Instead, I was surprised by finding schools of fish within minutes. They were Crappies all right and they were biting, but they were small. If I really needed to make a fish fry, I could have sorted out some 9 to 10 inchers. But I was satisfied getting the whiff of good air and snapping a few pictures. The fish, all of them, were well outside of the weed edges. They were on a clean sand flat the dropped slowly from 16 feet to 20 feet. The steep break from 20 to 30 had fish on it too, but they were either not Crappies, or they were not active. The fish on the flat were super active and all I needed to catch them was a small jig tipped with a 2 inch shad tail. There's not a lot anyone can do about the size of fish, except wait for them to grow up a little and then try again. While I was out there, it gave me the idea that if you've had a panfish lake or two in the back of your mind. Someplace you've always wanted to try, but haven't. I think you should jump on it right now. No, not tomorrow, Today! The water temps are perfect right now and your chances are the best that they'll be for the rest of the season. Fishing Report September 22, 2012 Jeff Sundin - Half a day of sunshine, half a day of clouds and half a day of blustery rain. Oh, wait a minute, let me add that up again. Ya know, 5 out 4 people have trouble with fractions. Here it is again; Mostly sunny and calm, with a mix of clouds and rain, accompanied by gusty West winds and a chance of snow. Yes, that about covers it. Luckily, it didn't mater where we fished or what we fished for on Friday. On what may have been the final trip of Pete Raquet's fishing season, life wasn't going to be too complicated. Just lets go fishing and have a good day. If everything goes well, we might even catch some fish. That's Pete, way too easy and way too generous. I decided to try for a panfish and Perch combo, hoping that one would serve as a backup plan if the other failed. Neither failed, but to be sure, The Perch fishing definitely was the better or the two. First, we tried for panfish, Crappie, Bluegill either would have been fine. Finding 58 degree surface temperatures, it wasn't much of a surprise to see packs of fish roaming out in the open water. In fact, finding schools of fish was really easy, but getting a frenzy started wasn't going to happen. Each time I located a school of fish on the Humminbird, we'd stop, drop in small jigs, one tipped with a minnow, the other with a cut piece of worm. It didn't take too long to figure out, the Bluegills were more aggressive than were the Crappies. Each pack of fish would give up two or three fish, then the action would fizzle out. Still it was worth the effort, because most of the fish were very nice size. We kept at it all morning, until mid-day when suddenly, the urge for some action set in. I had a warm feeling inside as I headed for the Perch spot, now ready to kick into gathering mode. The shallow water was even cooler than out on the lake, 57 degrees on the surface, with weeds and debris floating around everywhere. I had a few doubts as we started poking around, the fish weren't exactly coming to find us, but eventually, I did stumble into a small bit of territory that contained a school of fish. 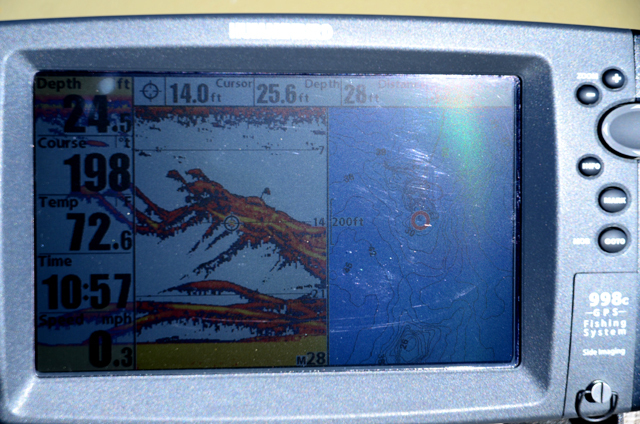 Once we had that area marked, the fishing got easier, especially after we mastered the art of getting the hook set. This was one day that I have to admit, color did make a difference. Pete had a 1/8 ounce jig, bright green, tipped with a Rainbow and he was getting twice the strikes, if not more than I was. I messed around with a few colors and combinations before I finally gave in and switched to a BE18353. Yes, that's Green. I did have some good luck tipping that green jig with a 2 inch Ripple Shad, the Perch color, green sides, black back and orange belly. On Friday, the Perch like to see the jig moving a little, holding it just above the bottom, out of the "Glup", flicking the rod tip just a little, that's what triggered our strikes. We had a good run of fish until the weather turned nasty. Boat speed got to be a problem and with the rain and wind blowing down our collars, I think we were both ready for a nice trip to someplace nice and warm. So with a dozen big 'Gills and a couple of dozen jumbos, we declared; "Good Enough For Us Guys" and headed for the barn. 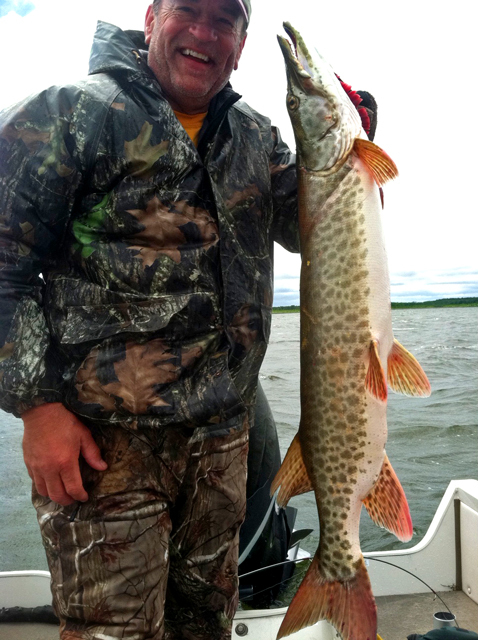 Fishing Report September 21, 2012 Jeff Sundin - Strong winds churned Northern Minnesota waters on Thursday. For anglers willing to work hard though, the rewards were many. The last trip of the season with long time customer and good friend, Bill Linder needed to be a good one; at least from my point of view it did. There are some people who never have to say a word, they just have a way about them that makes me want to give it my best effort. That's how it is with Bill, and on this day his pal, Girrard. Waves over the transom? No problem, just hold on tight, we're going in! Walleyes have been on the move lately, conditions have been good and so it seemed like a good time to take a risk and visit a lake that I haven't been fishing on since back in June. Known as a good fall Walleye lake, the smaller size and protected bays would help me manage in the gigantic winds that were predicted to blow into the area. When we arrived, it was quiet. There were a couple of rigs in the parking lot. At the dock, the water was noticeably clearer than the last time I'd seen it. One surprise for me, surface temperature readings in the 58 degree range. That's pretty cool for this early in the fall, no problem though, that's kind of chilly, but still well within workable territory. At our first stop, a semi-protected shallow point where a mix of rocks and weeds usually holds at least a few fish, it looked like it might be an easy day. 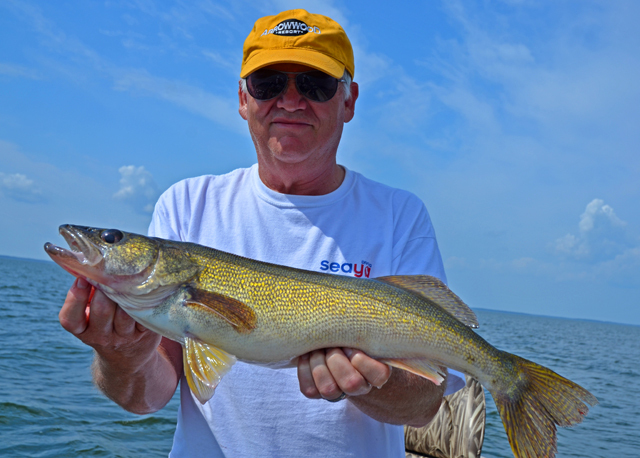 We hardly got started on our first drift when Bill caught a small Walleye, then another. A Northern Pike and a Smallmouth Bass joined in too and just when I got really excited about the spot, it fizzled out. Next stop, out into the waves. 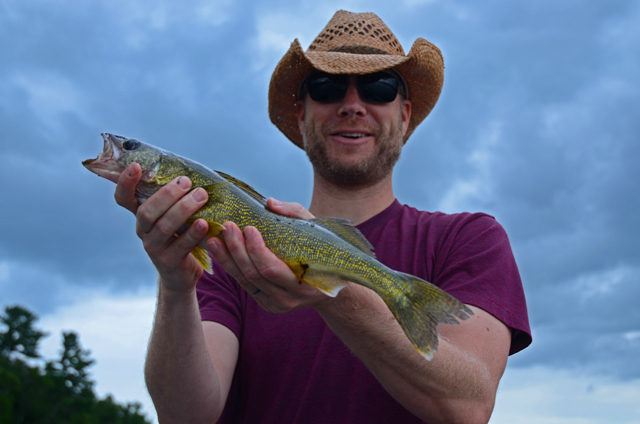 Another shallow, rock and weed point produced some nice, way above average Pike and another Smallmouth, but we didn't see our first keeper Walleye until the third stop. Here, a good size patch of Cabbage weeds, there were more Pike, another Bass and one more small Walleye. The weeds had a lot of potential, but drifting with the wind, the boat was just plain moving too fast. We were blowing through the fish and knowing that, I decided to make a move toward a spot where I could use the wind to my advantage. Another shallow rock point, surrounded by submerged weeds and with the wind blowing into the point. Now I could use the Drift Control Sock to slow down our drift while I used the outboard in reverse to hold the transom into the waves to control our depth. This controlled drift forces the wind to let me slip us along the outside edge of the structure and gives my crew time to work their baits. It was a little tricky, but it was what we needed to do. Soon, we started picking away at the Walleyes, one by one. An 1/8 ounce jig and minnow was our best bet, it was a little too heavy for the shallow rocks, and we got stuck in them frequently. But when we tried using the 1/16 ounce jigs, we couldn't keep them in the strike zone and very few fish were hooked. We repeatedly drifted the edge of the point until we passed into deep water, then back trolled around the edge toward the upwind side. Our minnows were a complete hodge podge. A mixture of Rainbows, Golden Shiners, Fatheads and a few Dace thrown in for good measure. All of them worked, but the best ones were 3 to 4 inches long. The largest minnows worked, but caught mostly large fish that we released. The medium size minnows got a higher percentage of keeper size fish that ranged from 13-1/2 inches up to 17 inches. Later, when I cleaned the fish, I discovered that they were packed with small, young of the year Perch. The small fish were blown helplessly onto the shallow rocks where the fish could gorge on them. Boat control was the absolute key to making the system work. The drift sock, the Big Tiller and my left arm were working working 100% of the time. But the Blue collar industrial strength fishing style, worked well. Even though we never had any wild feeding frenzy, the action was steady and at 4:30 PM we dropped the 18th Walleye into the cooler and headed for shore. (9/21) From the Park Rapids Area, Jason Durham delivered his Fishing Report; "Fishing in the Park Rapids area has been HOT over the past week. 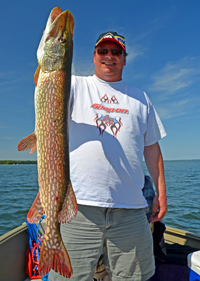 From bluegills to bass, walleyes to muskies, the fish have definitely been biting. As water temperatures dip to the low 60's, fish of all species have become increasingly active. Walleyes have been biting on numerous Park Rapids area lakes in 14-20 feet of water on both redtail minnows and nightcrawlers. Live bait rigs like Northland Roach rigs have been best for the crawlers while a Fireball Jig or Roach Rig will prove productive for the redtail minnows. Also, trolling crankbaits at dusk and after dark has also been effective for walleyes, though the depth to target is slightly shallower, 10-14 feet. 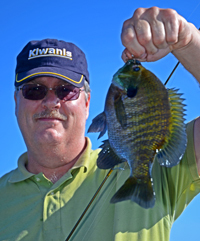 Bluegills and crappies have been biting well on the deep weed edges, 12-14 feet of water on small jigs tipped with a small leech or chunk of nightcrawler OR with a small plastic body, such as a Mimic Minnow or area favorite, Irvin's Magic Jig. Bass fishing has been spectacular, but do keep in mind that smallmouth bass are only catch-and-release statewide. Look for smallmouth bass cruising in the shallow water on warm, clam days, but otherwise hit the steep drops, points and humps that they gravitate toward during fall. Largemouth bass, however, are very shallow right now, less than 8 feet deep. Spinnerbaits, jig-n-pig and topwater baits have been the ticket. The lily pads are beginning to die and working a spinnerbait or Northland Jawbreaker Spoon through that decaying vegetation is really easy right now. Not to mention, the big bass are waiting there ready to strike. Muskie fishing has been great, with anglers reporting nice fish, active follows and a couple trophies over this past week. One group reported landing 8 muskies in three days on Mantrap lake while working the cabbage and coontail beds in 10-15 feet of water. 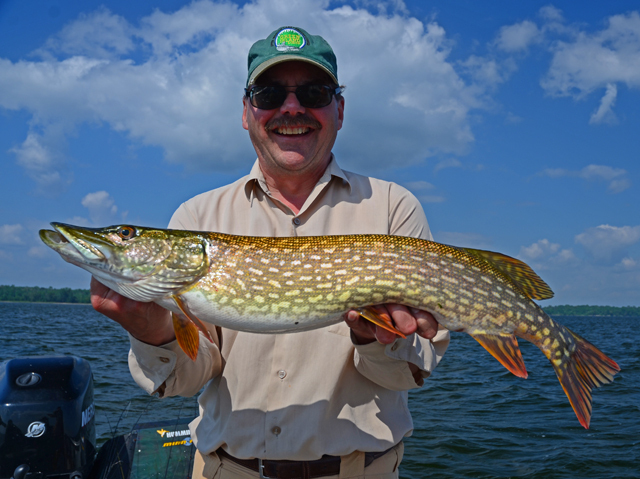 Northern pike have also been biting well and if your goal is a nice sized fish, make sure you have a leader tied on. Though northerns are incidentally caught while fishing for other species, it's common for them to cut your line with their razor-sharp teeth. When specifically targeting the pike, try spinnerbaits, a jig and a minnow combination and flashy spoons to get their attention". - Jason Durham, Go Fish! Guide Service, Inc. 218-252-2278. Oh, and by the way, did you know that all of these fishing reports are archived? Yes, you can go back and compare what's happening now with what happened last year, two years ago, even more! Just click >> Fishing Report Archives . 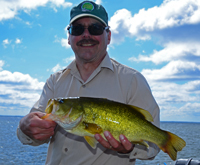 (9/19) Bemidji Lakes Area, Paul A. Nelson, Bemidji Area Lakes Guide Service says; "Lakes in the Bemidji area continue the fall cool down, with surface water temperatures in most lakes in the low to mid 60s. Large lakes that are roundish in shape will cool down faster in the fall when the weather is windy, because the water in the lakes keeps getting mixed by the large waves. Long narrow lakes with lots of shoreline and islands to break up the waves don’t get mixed nearly as fast in the fall, so they take longer to cool down. The thermocline is still in place in most of the deep lakes, although it depends on how deep the water is in the specific location anglers are fishing. Most fish species are still above the thermocline in the lakes where there is a thermocline. Anglers should be able to see the thermocline on their electronics, with some species like crappies and walleyes often schooled right above the thermocline in the fall. Jigs and minnows will catch almost any species in the fall, if anglers match their presentations to the species of fish. Tiny hair jigs or small jigs with micro plastics work well for crappies, sunfish and perch. Anglers can also use live bait on small jigs like minnows, leeches, pieces of night crawlers, wax worms or eurolarvae. 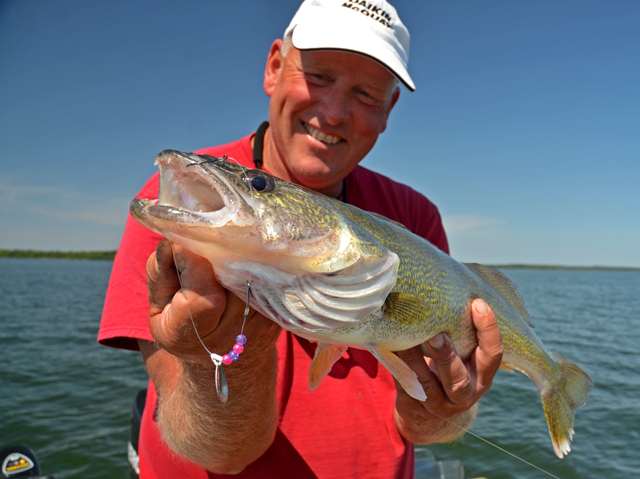 Walleye anglers like to match the weight of the jig to the depth and wind conditions, only using enough weight to keep in good contact with the bottom. Northern pike and bass both like hair jigs tipped with sucker minnows in the fall. Bass will take the ¼ to 3/8 ounce jigs with small to medium suckers, while pike usually prefer larger jigs with a medium sized sucker minnow. September 18 , 2012 - On Lake Winnie and Cutfoot Sioux - Water temperatures continue to fall and the action is heating up. So far, we can say that anglers who want to do well on Walleyes, are going to have to work at figuring out the best locations. But, if you keep after them, they are willing to bite. 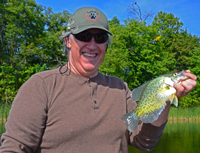 Panfish have been heavily pursued over the past couple of weeks, and while they are active, your timing has to be good if you want to get in on a good action bite. Crappies are building up along steep breaklines, especially in small inside corners or deep holes directly adjacent to the shoreline. One of our guides, Jeff Sundin has been using the side imaging on his Humminbird to locate small piles of debris on the bottom. Although the smallest sticks, rock patches or sunken logs of hold only smaller packs of fish, he believes that the smaller packs of fish offer a better opportunity to ... Read >> Bowen Lodge fishing report . Fishing Report September 20, 2012 Jeff Sundin - Blustery conditions on Wednesday, kept I and long time customer Skip Finch, hunkered down, searching for a few calmer spots to catch a fish. I know, you've been there yourself! One of those September days where the weather is just plain crummy, but you want to try and get a good fishing trip in spite of it. With the West winds blowing in at 20 MPH and rain showers slapping on the backs of our hands, it was hard to get a really great head of steam going. But by jumping back and forth from the Perch hole to the Crappie hole and then back to the Perch hole, we did manage a respectable showing. Surface temperatures were down to 57.5 degrees in the shallows where we've been catching Perch. It may have been the colder temperatures or maybe the low pressure system or maybe it was just time for the fish to move out. But however it happened, the action dropped off quite a bit from what it was. It wasn't completely over, just slower and much more spotty. When it came to what caused the Crappies to go dormant, I guess that it can only be the low pressure system. The surface temps were in ideal range, 61 to 62 degrees and finding a school of fish on the Humminbird was easy. The schools of fish were stacked in a variety of locations, the small ones were catchable, but larger fish were a scarce as hen's teeth. Read the reports from earlier this week and you'll know everything I've been doing, so there's no need to re-write it. Check in tomorrow though, because For today, I'm back on a mission to find great Walleye fishing. Maybe a few Crappies too, if there's time. With any luck at all, a buzz around the island is all we'll need to find the magic spot. Fishing Report September 19, 2012 Jeff Sundin - For anglers in Northern Minnesota, it's time to roll out the fishing rig and get back onto the water. Water temps are down into IDEAL range, and the fish are responding to the urge to feed. You're going to hear some reports about slow days, spotty fishing or whatever other isolated problem might crop up for a day or two. But overall, we are on the leading edge of what promises to be great few weeks of fishing. For my crew, Tuesday was another Perchy day, and a good one at that. We've been finding nice size Perch in shallow water. Weeds mixed with any sort of hard bottom, sand, gravel, rocks are occupied with roaming schools of Perch. The fish we've been catching are loaded with tiny, young of the year panfish. Due to the cold overnight temperatures, small Crappies and Sunfish are being forced out of the shallowest weed cover where they spent the summer in relative safety. Moving into deeper, warmer water weeds, they have found themselves in the kill zone with targets painted on their backs. Simple jig and minnow presentations will work. If you have a hard time keeping your bait off the bottom and out of the moss, then use a bobber to suspend your jig over the bottom. If you drop the jig over the side, hold it still and don't get a bite, then it's time to roam around. It might take a while to find them, but once you do, you'll be able to stay in one spot for quite a while. While I'm on the subject, Leech Lake Perch Fishing is going well and so is Perch fishing on Cass Lake. On Leech, fish are also located in the weeds, somewhat deeper than their cousins on Winnie. Try the 8 to 10 foot range and on Leech, I prefer a heavier jig. Fishing with a 1/4 ounce jig and minnow combo, I can get the bait to the bottom faster. That helps me avoid all of the 6 inchers that race toward your bait as it falls in the water. Get underneath those small fish fast enough, and you will be able to get in front of those Jumbos instead. Cass Lake Perch are a little different, they like depressions found on the shallow flats. A six or seven foot flat with a spot that dips down to 8 or 10 feet usually holds some fish. If there's a few weeds, that makes it better and obviously, the more baitfish in the area, the better the Perch will like it. Getting back to Winnie, There was a good Walleye bite going on at the same time we enjoyed the Perch action. In fact, if we wouldn't have been on shore cooking lunch, we might have gotten in on the best Walleye action. As it happened though, we made our way out to the Bena Bar just in time to watch the action winding down. We still managed to catch a half dozen Walleyes using Lindy Rigs and Night Crawlers. For some reason, the wind kicked up just at the wrong time and my chilly crew, not used to rigging, just didn't have enough time to get practiced enough. If was going to zero in on Walleyes today though, I would definitely head for the deeper, main bars like Bena, Horseshoe, Moses and Sugar. All of these bars connect to the shallow water, so fish can easily move between the gigantic structures and the shoreline. Fishing Report September 18, 2012 Jeff Sundin - Three easy days in a row, water temperatures trending down and not hardly a boat in sight. Hmm... if you've been on the fence about getting back out on the water, I think you better start scrolling through your calendar to find an open day! On Saturday, the wind blew, the fish were biting and I was cautiously optimistic, On Sunday, the wind shifted 180 degrees, still blowing and the fish bit again, now I was optimistic for sure. On Monday, the wind didn't blow that great, but the fish bit anyway and before the day was over, I was the Vice President of the newly formed, Cutfoot Sioux Optimist Club! You get the idea, I think it's safe to say that the fall bite is currently on schedule. Now it's time for you to follow the water temperatures. In order to take advantage of the best action of the season, you have about 7 degrees worth of cooling down left before we'll be looking forward to the fall turnover. After the turnover, fishing will still be okay, but it's definitely better on this side of the drop. Monday's trip was split into two fishing groups, Walleyes on Winnibigoshish in the morning, Perch on Cutfoot Sioux in the afternoon. Without doubt, the afternoon was more action packed, but the morning wasn't bad either. There was a slow start caused by an overnight drop in the surface temps from 64 degrees to 61 degrees. As the morning breeze kicked in, the fish responded and by mid day, Walleye fishing was getting downright reliable. We boated 13 Walleyes, all of them except two were in the protected slot and most of them were over 20 inches. Jig and minnow combinations were all we used all day long and because of the relatively light wind, we stuck with 1/16 ounce jigs. Perch were located in 6 to 7 feet of water in the weeds, hiding in small clear patches. I had a bucket full of nice size Rainbow Chubs, nothing else, so we used the large minnows for all of our fishing. During our Perch fishing session though, we cut the minnows into 3 pieces and just used a single chunk on the jigs. If you asked me, I'd say that the chunks performed better than whole minnows do. They stay on the hooks longer and they get bit, really well. Fishing Report September 17, 2012 Jeff Sundin - A new day, a new wind, another good fishing trip. I don't want to sound too much like a salesman, but it looks like the fall bite is working up a head of steam. If not, at least it's been a good weekend. On Sunday, I had the opportunity to prove how good my luck really is. Fishing with a mixed crew, an old friend and two new friends, I had already put out the disclaimer that fishing has had its ups and downs lately. Reminding them, that while we had a great day on Saturday, shifting winds could have changed the outlook for the whole day on Sunday. Well, luckily, it wasn't too much different, we only had to move about 200 yards away from Saturday's Walleye hole to find a new one for Sunday. It was the kind of fishing day that I just love. Steady as she goes, no giant rush of action and no giant stretch of down time. Just a nice steady pace that offered equal opportunity for everyone. In fact, I think it's almost fair to use the word "perfect", but not quite. Fishing the wind blown points and weed edges, we were able to find small pods of fish almost everywhere we stopped. We fished jig and minnow combinations in 9 to 12 feet and weed edges with rocks mixed in were a key! Sorry for the short report, I'll expand on all of this tomorrow, but right now, gotta run. Fishing Report September 16, 2012 Jeff Sundin - Back to Walleye fishing on Saturday and this time, it reminded me of fishing in September! When I picked Bob Carlson up at Fred's Bait, I wasn't really sure where I was heading, I just knew that we were going to need some Walleyes. I thought maybe a few Crappies would be nice too, so maybe a lake where we could do double duty would be nice. Along the way, my truck decided to take me to one of the lakes that treated me well earlier in the summer and the plan was to give it a whirl, then leave for lake #2 if we needed to. At the landing, the 63.5 degree water temperature and the above average chop on the surface were good news. To borrow a phrase from the TV News Dudes; "All of the leading indicators were positive"! A quick stop to try for Crappies turned out okay, but not great. A school of fish hovering in 18 feet of water on a steep breakline, provided a quick spurt of action, but it was short lived. The fish have already been heavily pursued this month and finding fresh schools of fish is getting a little tricky. We did manage to pull out a half dozen before the school of fish got lockjaw, a good start, but time to move on up the lake. The search for Walleyes began and ended at the very first stop. A stretch of shallow water extending from the shoreline out into the main lake. The weedline extends out into about 9 feet of water and at the deep end of the point, there are mixed rocks and gravel. The Southwest wind was blowing onto the point and giving me just enough chop to spank the Wave Wackers. Walleyes were spread out along the entire stretch, but were particularly attracted to a couple of subtle points that bulged out from the weedline. Holding the back of the boat in 10 feet of water was all I needed to do. The wind and the fish did everything else for me. We were fishing with 1/8 ounce jig and minnow combinations, the minnows were on the large side, at least 4 inches some even bigger, but they worked perfectly. Rainbows, Fatheads, Shiners, it didn't matter. The only ones that didn't work very well were small ones. Typical jigging styles like snapping, popping and ripping were all good. The fish were on the prowl and hitting aggressively. Okay, so that was one good day. Now we'll have a chance to test the system as today's crew tries to replicate the system. Fishing Report September 15, 2012 Jeff Sundin - On Friday, someone looked me right in the eye and said; "Boy, the Walleye bite really went to crap, didn't it?." I suppose if you look at it that way, you could say that it did, for about 12 hours. But what about before that? or After? No waiting on lane 4, drive thru food, Google ... the list goes on and on. We've become an instant reward, push button world. If it doesn't happen right now, it ain't gonna happen. I guess that's the way it is, but it's sure a lot more fun when you just go with the flow. Sure, it was a hard day to catch fish on Friday. The sun was high in the sky, there wasn't a ripple on the lake and after feeding for the previous two days during windy conditions, there were just a lot of fish enjoying a nice nap in the weeds. You know what though? It wasn't impossible, it was just one of those days where you have to work harder for less. Honestly, there's really nothing wrong with that, it's just how nature works things out. All of the baby fish that you're going to catch in 3 years, when they're grown up, need a chance to feed if you want them to live that long. They can't do it if the big boys are feeding 24-7, so sometimes, the bigs ones take a nap and the babies get a chance to play. Take it a step further; Even on a slow day, there were still some opportunities out there that few knew about and even fewer took advantage of. I came to the party late, but I'm sure glad that I came! When the Nolan's, Mike, Atcha and I started our day, we knew it wouldn't be easy to coax the fish out of their shady hiding spots. But even in the glassy water, we did get some strikes and sometimes, we'd even actually hook a fish. I spent the better part of my day acting as a cheerleader. You know; "Don't give up, don't get discouraged, we're gonna find 'em, they're just around the next point." No, we didn't have to head for the marina to get a bigger livewell installed, but by days end, we did have enough fish for a great meal and enough left over to send home for later. Getting back to opportunity though; The event that really made our day was the power of suggestion. In this case, not even really a suggestion, just the the little finger that taps you on the shoulder and says, what about this idea? It took a while for it to sink in, but it was worth the wait. Like a lot of days on the water, friends are comparing notes with me about how the fishing trip is going. Getting 'em deep or shallow? Walleyes or Crappies? You know, just general conversation that mostly just helps pass the time. On Friday though, one of these exchanges changed the outcome of our whole day. While we were plodding along, getting a fish here and there, I got a text from a friend; "Hows you day?" I answered that the fish were on nap time, but that we were chipping away. The reply; Weather is great and the Bass are happy and active!". That was great news, but not for me, at least not yet. After a few hour passed, another note, this time it was about another Bass, a real beauty! They were guessing that it might have weighed five pounds. Oooohh...... now I'm getting envious, now I want to be there. So I turned and said; "Boy I sure wish we were Bass fishing right now, my friends are whomping 'em." That's when Atcha said; "We love Bass fishing!" Mike chimed in; "We'd rather have Bass than Walleye!" Wow, I wish I'd known that at 8:30, but knowing it now, we should be sure to keep that on the list for next time. Unless, .... what if .... ? You guessed it, late in the day, I just happened to end up close to a nice, heavy patch of Bulrushes. I said, ya know, sometimes there are Perch in there, sometimes Rock Bass, maybe Sunfish, but just for fun, I think I'll try throwing in this Yummy Texas Rigged plastic ......... -- WHAM--! A nice, chunky Largemouth Bass. Maybe 18 inches, just the right size to get everyone's attention. For the next hour, we had to make do with a general shortage of Bass gear in the boat, but I cobbled together enough stuff to get us into the game. Before we left, we dragged eight nice Bass out of that heavy cover. If we'd had a couple of more hours on the learning curve, and maybe a couple more heavy rods, we could have done even better. But for us, this little spurt of action turned what was a nice day, into a great fishing day too! I don't get any of the credit, none at all, I just reacted to the messages I was getting. But you can bet your life, that the next time we're having a slow day, I'm gonna turn to my right and ask; "Whatd'ya think about Bass fishing?" Fishing Report September 14, 2012 Jeff Sundin - Water temperatures sink into the mid 60's. Fishing reports from around the Deer River, Lake Winnie area were mixed, but generally positive on Thursday. 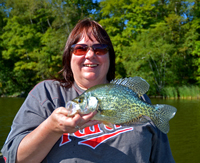 Walleye, Crappie and Sunfish action remain reliable. This summer and early fall, I've been on a mission to move into new territory. I've wanted to find places where we could enjoy fishing, but with a greater emphasis on connecting to the wildlife, the scenery, you know ... the deeper side of what life in the Northland is all about. Sometimes I get the balance just right, sometimes it leans further one way than the other. Either way, I'm doubly lucky when I get to fish with people who get an equal thrill out of both. It's pretty darn hard to have a bad day when the whole crew is on the same page! Fishing for us on Thursday was like that. Our idea, let's just take a day and explore to see if we can find a cool spot. Since I'd already heard from a bunch of fishing buddies, and had a fairly good idea about who was doing what and where they were. And knowing that the fish have been just reliable enough to provide action for a boat or two at each spot, but not for a crowd. I decided to try and stay away from where everyone else was fishing. That part worked out wonderfully, the fishing was good enough for us, but not exactly action packed. At the landing, we found a surface temperature of 64.8 degrees, that's getting awful close to ideal and I had hoped it was cool enough to send some fish out of the shallow weeds and onto the deeper breaklines. At our first stop, I really thought we'd be in great shape. As soon as we tossed our jigs toward the weedline, we got strikes immediately. Smaller Walleyes, Perch and Pike we tucked into the Coontail, just inside the drop off. As we moved from spot to spot, the trend was the same everywhere. Mixed schools of fish were still hiding in the heavier weeds and rooting them out was the only way to be productive. There was one school of Crappies located on the deeper breakline in about 18 feet of water, they were pretty un-coaxable, but easily spotted on the Humminbird. I'd guess that a trip back, closer to the evening, or maybe even just during a cloudy period might be a good idea. Speaking strictly in terms of fishing production, I'll probably have to scratch this lake off the list, at least for a while. But in terms of fulfilling the complete "Northern Minnesota experience", well then it was a clear winner! September 14 , 2012 - On Lake Winnie and Cutfoot Sioux - Walleye fishing the fall patterns is getting easier, but you still have to keep the search going. 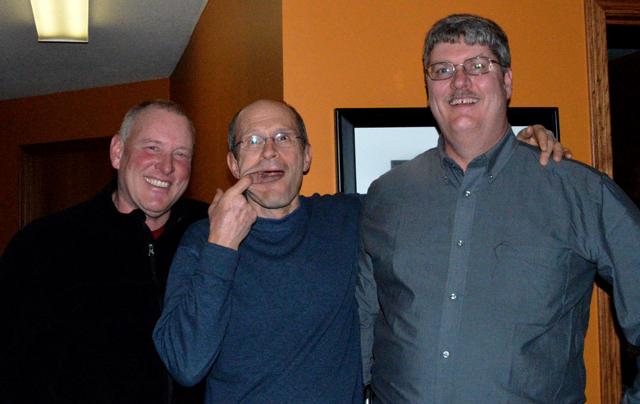 How about this story, a good friend of Bowen Lodges fished for 5-1/2 hours without bagging a Walleye. He could have gotten discouraged and given up, but instead, he tried one more spot. This time, the stop paid off and they worked the small spot, an underwater point and caught nine keeper size Walleyes. He turned the trip into a success by sticking to it until he found a school of active fish. That's where we're at right now, not only on Cutfoot, but on Winnibigosh too. Fish are active, willing to bite and completely catchable. They're just not roaming in large schools yet. Weedlines, submerged points and rocks are becoming key locations. Breezy weather brings out the best in a spot, so when you can ... Read >> Bowen Lodge fishing report . (9/14) In the Bowstring Lake Area Otters Guide Service, Robby Ott Says; "Wind anyone, over on Sand yesterday, we started probing around for crappies (a real early start). With a hunt and peck technique and we were able to run into a couple of spots where they were condensed. They were located on points or inside turns of the points. My guess is that they are waiting for mother natures signal to send them to there winter haunts. 1/16th oz jigs with chubs did the trick. We then ventured out in the Big Lake where, BOOM, that NorthWest wind slapped us right in the face. Took advantage of the wind and soon met up with some real aggressive walleyes, 10 feet of water was the sweet spot. Tried crawlers and chubs, I would give the knod to the chubs. Ran across alot of schools of bait fish that they (walleyes) were feeding on. Along with that, alot of debry in the water. Vegetation that is dying off, getting swept away by the strong winds. All in all a very successful day on the water. I had a couple of cancellations for the weekend, so if you want to go one last time let me know. Mike and John, when you read this, I look forward to next year and I hope your recovery is going well ( I'll keep the fish warmed up for ya.)" - Good Luck and be Safe. Otters Guide Service . (9/14) Zach was on Cutfoot Sioux yesterday and had a great day. He flattered me by giving me credit for teaching him something. Trying to avoid allowing my head to swell up, here's what he said; "I've learned a lot this year from my good buddy Jeff Sundin, who has taught me one thing for sure; That's how NOT to turn a bad day, into a horrible day. So with that bit of knowledge in mind. We decided to switch things up a little bit and started looking for some ....." click here >> Read Complete Grand Rapids Report . 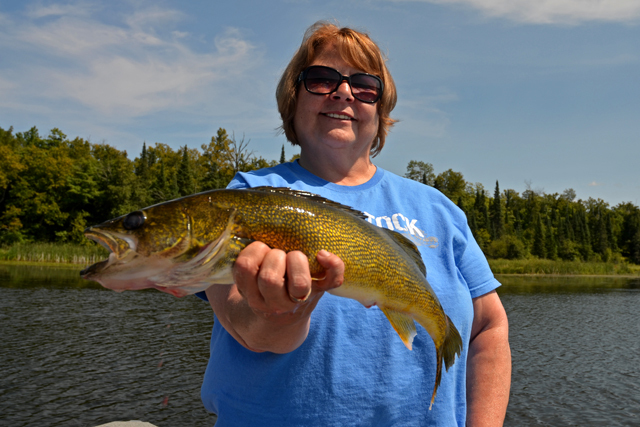 (9/14) On Lake of the Woods, Sportman's Lodges, Jacki LaValla said; "Good fishing right outside Pine Island and Zippel Bay using minnows or shiners and a hammered gold spinner or controlled depth crank bait fishing in 23'-31' of water. Both techniques are working equally well. 60% Saugers & 40% walleyes caught this week. Current water temperature is 63 degrees, down from 69 last week. Forecast looks warm and light wind the next few days and then a cooling trend starting Sunday through the week. The weather should help cool down the water and start setting the stage for the emerald shiner run and incredible Rainy River fall fishing we look forward to every year." - Call now to get our $39* per person lodging special for reservations now through Nov 30. *rate based on dbl occ and plus tax. Fishing Report September 13, 2012 Jeff Sundin - Blustery weather returns to the Northland! Fishing with the crew from Drake Airo is always a good time, plenty of smiles and never a dull moment. But, we've had better fishing before. It was just one of those days; the wind was blowing about 25 MPH and for me, it was really tough just to try and keep a fishing rod in my hand. When we arrived at the lake, whitecaps were already rolling across the surface. We knew that the waves would be a challenge, but the surface temperature was still hanging in there at 65 degrees and I had high hopes that we could hurry out and make one final appearance at the Crappie hole before it fizzled out. You know, get in there quick, catch a bunch of fish and still have plenty of time to move on to another productive spot. Well, either the fish already made their move, or the wind just made it impossible to find them. Three foot waves, weren't exactly the recipe for success, but we hung in there for an hour or more. After a while, we figured that we'd done the best we could and caved in to the Crappies. Luckily though, making a few drifts did produce some Walleyes, so I at least we had a head start. We put the boat on the trailer, headed North and tried again. This time, we found out that there was a mother lode of what I can only call "Glop" that had built up on weeds, Bulrushes and along the shoreline. I guess it was because of all the warm weather this summer, but whatever caused it, the soft, hairy moss was just about impossible to fish through. There were a couple of particularly good spots on the lake though and somehow, I managed to stumble into them. One spot in particular, a semi protected shoreline where we drifted until we had come almost all the way across the entire North side of the lake. Another small, clear spot near the landing, was chock full of Perch. They weren't giants, but they were active and most of them were just touching the border at 10 inches. Good fish for a shore lunch or to round out the bag heading for home. (9/13) On Cutfoot Sioux and Lake Winnie - Zach Dagel, checked in with a quick note. He has been doing a little exploring on Cutfoot Sioux and with the wind under contro, Walleye action was good on Tuesday. Zach was fishing the ..... click here >> Read Complete Grand Rapids Report . Fishing Report September 12, 2012 Jeff Sundin - Fall is in the air, at least it is a little bit. Water temperatures are trending down, days getting shorter and fish are responding, at their own pace. Winds moderated on Tuesday and that made it much easier to concentrate on catching fish instead of just holding on for dear life. There's been very little change in the water temperatures over the past couple of days, but generally, they're slipping down. On Tuesday, we found surface temperatures ranging from 65 to 67 degrees, depending on the time of day and the location on the lake. There was a fairly heavy Algae bloom, in fact heavier than usual for this typically clear water lake. With lots of sunshine, all of the area lakes are still sporting heavy blooms. 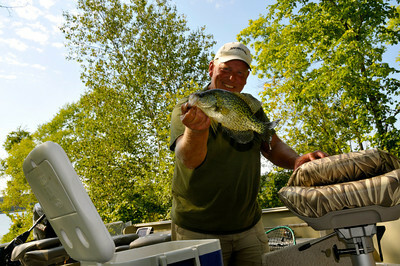 We started our day with a session of Crappie fishing; As it has been over the past week, the action was really good. It hasn't been taking us long to find them, or catch them. Generally, we have been able to fill our bag limit within a couple of hours. But I'll let you in on a little secret, just between us. 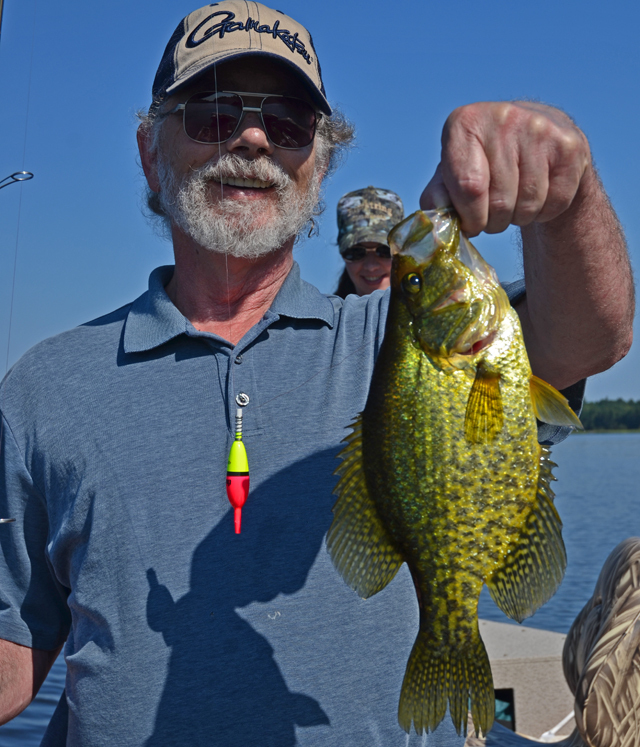 The Lion's share of Crappies are not where you'd expect to find them at this time of the season. Keep in mind that in spite of the date on the calendar, we are definitely still in late summer fishing patterns. After lunch, we fished for Walleyes and found the action slower than the Crappie fishing, but it was better than we expected for the high, sunny skies and relatively calm water. Fishing the weedlines in 10 to 12 feet of water, using Lindy Rigs tipped with night crawlers, we picked up seven keeper size fish, a few smaller ones and a handful of mixed Panfish, Perch and Rock Bass. I've been using the worm blower to inject a bubble of air into the crawlers, that helps keep them off the bottom and reduces snags. Late in the afternoon, the wind picked up and we did switch to jig and minnow combinations for a short time. We caught a hodge-podge of fish, most of the action though came from small Northern Pike that were in that mood to bite the jigs off. Jig sales were definitely up! I think we're going to see an uptick in the jig and minnow bite soon, but for now, you might have more fun using night crawlers. We're in the middle of the mid-week report updates right now and from what I'm reading, everyone has been reporting similar experiences. (9/12) On The Iron Range, From Greg Clusiau; "The mornings may feel like fall but in my book it’s not officially here yet because the lakes are behaving like it’s still summer, which means traditional fall fishing patterns just haven’t gotten underway. Blake and I put the miles on again last weekend, fishing from Lake Vermilion to Cut Foot Sioux, along with parts in between. Here’s how it all went down. Lake Vermilion - Arriving at the lake early Saturday morning, we" ... >> Read Greg's Full Report . (9/12) Bemidji Lakes Area, Paul A. Nelson, Bemidji Area Lakes Guide Service says; "Lakes in the Bemidji area have begun their fall cool down, with surface water temperatures in most lakes dropping into the mid 60s this past week. Most species of fish have been active, but when fish change locations, anglers have to find them before they can catch them. Walleyes in most of the deep water lakes have moved off the sides of structure into deeper water. There will also usually be fish that stay shallow, so most lakes will have at least two active patterns as the lakes cool down in the fall. 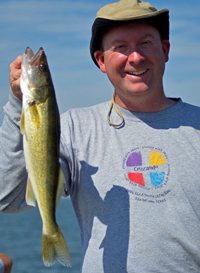 Walleyes in shallow lakes like Winnibigoshish, Upper Red Lake and Leech Lake have been moving shallow, with most walleyes on shoreline weeds or rocks in 6 to 12 feet of water in most situations. Perch anglers are finding schools of perch moving on to large shallow flats covered with a mixture of chara (sand grass) and/or rocks. Perch are active feeders that like a variety of choices for food, with crayfish, minnows and smaller perch all on the menu. Crappies are moving towards structure and getting more active during the day. Most crappies spent the summer suspended over the top of the thermocline, but as the thermocline breaks down, crappies will almost immediately move towards structure in deeper water. 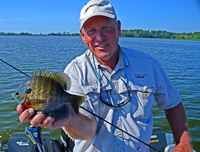 Bluegills will be on the edges of the greenest, healthiest weeds, with cabbage, coontail and northern milfoil all tall weeds that give bluegills cover and hold insects on the leaves. Bass are beginning to move out of the super shallows towards the outer edges of the weeds, with reeds, cane, wild rice, lily pads and bulrushes all potential cover for bass. Fishing Report September 11, 2012 Jeff Sundin - Strong winds forced a change of plans for us on Monday. Fishing on the North end of Leech Lake was a great idea until we found out that the South winds were gonna come in at upwards of 30 MPH. On my way across Highway 2, heading for Sucker Bay, I called ahead to give the crew a heads up about the predicted winds. It didn't take much coaxing from any direction before we had decided that an alternative game plan might be better. To begin with, a slight adjustment put us on the South end of Lake Winnie where the wind was strong, but manageable. At the landing, we were greeted by calm seas, clear water and a surface temperature of 66 degrees. By the time we got out about a half mile out on the lake, the whitecaps and gusty winds got a grip on us. A turn back to the South corrected that and we settled into a stretch of weedline where we could drift, but were still out of the worst wind. At first, it looked like we had made a great decision. A shallow weed bed in 6 to 7 feet of water held a school of fish. They were cooperative, but we caught three in a row that were all over the protected slot size. Two fish in the 20 to 21 inch range and a third, 23-1/2 incher. Nice fish, great fun, but if you're fishing for the dinner table, it's not a good idea to stick around. Things got a little discouraging when series of moves into other weed beds and shallow shoreline structure were giving us nothing to work with. I had all kinds of great ideas about places where I wanted to be, but none of them were in friendly territory, at least not at the time. A move up to Cutfoot Sioux would be easy, so we trailered up there for a do-over. Here we go, DejaVu all over again! The very first spot we stopped at had a nice little school of fish sitting there waiting for us. We caught a few more slot fish and a few keepers too. A handful of small Pike got into the act too and for a while, it seemed like we had just made a fantastic move. But once the action on this spot fizzled out, I just couldn't find another good one. I'm not sure what I did wrong exactly, but I never got another good school of active fish under the boat. There were times that I found fish that we couldn't persuade, times that we caught odds and ends, but never another good shot at the Walleyes. After spending the afternoon feeling helpless while I was looking at several Crappie spots that were getting pounded by the waves, I finally couldn't take it any more and talked the boys into one last stop in Little Cutfoot for a shot at the Crappies. We didn't spend enough time to perfect the system, but we did have some action. We only fished one small area, but it was friendly. Even the dock was friendly, greeting us with a little smile and pointing to a school of active fish. Most of the fish were on the small side, but there were enough for a good meal. We wrapped up the trip after that spot, but I'm sure that we would have found better size fish if we'd tried a few more areas. The same thing holds true about our experience on Winnie. I really think that I should have stuck around out there and waited for the fish to settle in. Sooner or later, we would have figured out where there was a good bite. But feeling pinned down in rotten territory just because it's the calm spot isn't much fun either. When you're not catching, it's awful tough to stick around. Luckily, we did manage to catch a fair dinner pail full of of fish for supper. The boys were super nice, very welcoming and fun to be around. So it was a fun, fast moving day and for Bob, a good warm up. Fishing Report September 10, 2012 Jeff Sundin - Sunday's calm weather gave us a breather from the rockin' and rollin'. A nice way to spend a day, maybe not the fastest action, but good enough for us. I'm up against a couple of big projects here this morning, so I'll be cutting the report short. We were fishing on Sand Lake where the surface temperature began at 67 degrees and before days end, had risen back into 70 degree territory. The lake still has a fairly heavy Algae bloom and as the calm water soaked up ray's of sunshine, the surface bloom got noticeably heavier late in the day. The upshot of Sunday's Walleye fishing was a return to the weedline, where the fish showed a strong preference for the Night Crawlers again. This time, the shoreline weeds were more important than the weeds out in the center portion of the main lake. While the Walleyes were near the weeds, they weren't really buried in them. I think that the color of the water has a lot to do with that. Another departure from my experiences on the lake earlier this summer, was that a Lindy Rig with a plain leader and an air injected night crawler was far better than the jig and crawler combo I'd used earlier. Simple, but effective, the Lindy Rigs managed to trick enough Walleye so that we could claim a victory. I'll expand on the patterns as time allows. For today, I'm heading West for what could turn out to be a whole week of fishing on Leech Lake. There's been an eerie silence about the action on Leech this summer. 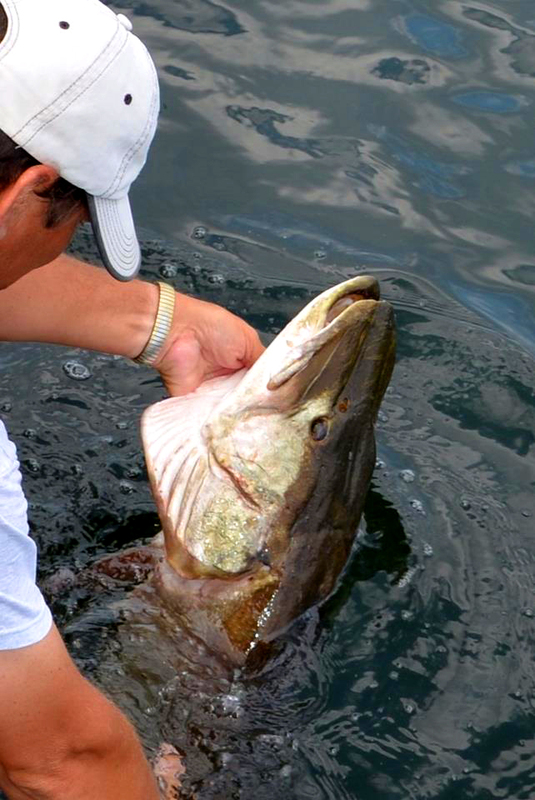 This is typically a great time to fish the giant though, and I'm hoping to have a lot of good information soon. Fishing Report September 9, 2012 Jeff Sundin - A blustery day on Saturday added a new dimension to our fishing, four foot rollers! Don't get me wrong, I'm not complaining, it had to get here sometime, but the colder winds are forcing some changes on the lakes; Fall, is working it's way in and we're going to be making some adjustments. When I arrived at Bowen Lodge to pick up my crew, the whitecaps were rolling onto Bowen's Flat and the tree tops were already bending over. We chatted about the conditions on some of the smaller lakes and what the fishing options would be. We had planned a split at mid-day, so that, combined with the heavy seas was making us lean away from heading out on the big lake. I mentioned seeing a sign on may way in, I couldn't read it all, I just remember it said something like; "I don't think you should go up there without a paddle". Okay, so we headed East with the idea of fishing for Walleyes, with the Crappies as a backup plan. We launched the boat on the calm side of the lake and found water temperatures at 66.5 degrees. A drop of 8 degrees since mid-week. We started fishing on the weedline, the same one where I, Mike and Atcha Nolan caught our Walleyes and Perch on Friday. This time though, the fish were gone. Knowing that the wind was only gonna get worse later in the day, I decided to buck the waves and head for the Crappie hole. Now we were on the windy side, water temperature was 67.5 a little warmer, and there was a two foot chop on the surface. It was rough, but not impossible to control the boat. I'll get back to this later, but I do need to mention that without a Big Tiller, Wave Wackers and the willingness to get sore feet from standing at the tiller, you might as well just fish from the dock. Luckily for me, I have all of those things and along with a crew who got a kick out of toughing out the waves, we were able to manage catching nearly their limits of Crappies and a few bonus Walleyes. In fact, if we wouldn't have lost any, or if the giant wind would have held off a little while longer, we would have made it. By about Noon though, the wind was howling and the waves were crashing up over the bow, it was just plain time to get out of there. The Crappies had been holding in about 8 feet of water, on a rocky point surrounded by weeds. In the heavy water, we used 1/8 ounce jigs tipped with larger than normal minnows. Way larger than normal, Shiners in the 3 to 4 inch range are not a problem for the big Crappies and using the larger bait gives you a better shot at attracting some Walleyes. Yes, it cut down on the number of smaller Crappies we caught, but who cares? In that heavy water, reeling in small fish just wastes a bunch of time anyway. On our way back to the landing, we tried one more stop on the calmer side of the lake. Northern Pike were fairly easy to catch, but except for a couple of missed strikes, Perch and Walleye were still absent. On the trailer and up the path we went, heading back to Bowen's for phase two. This time, I found out about a time element. One of those hard deadlines that drives me crazy! Knowing that I was in a hurry, we decided to stay on Cutfoot Sioux for the rest of the afternoon. With only one passenger, fishing in the whitecaps wasn't that bad, as long as I didn't take my hands off the tiller. Our first few spots all yielded a few fish. Mostly a mixture of small Walleyes and a handful of Perch. We tried several of the "usual spots", but as we fished, I kept looking at one particular point. The wind was pounding into the point and had been for the past three days. A little birdy kept telling me to run over and try it and I finally listened. Good decision! The point topped out at about seven feet, has a small patch of weeds on top and then drops into deep water. The Walleye, along with some Northern Pike were holding at the tip of the point in 12 feet of water, just outside the weedline, but not too far way. Pitching our jigs toward the weed edge, then letting them fall onto the drop off, yielded somewhere close to a dozen fish. About half of them were on the small side, but were legitimate keepers ranging from 13-1/2 to 15 inches. Now the other half of the Walleye we boated were very nice fish. About a half dozen in the 20 to 21 inch range gave us a little something to giggle about. If I could have spent more time, we would have checked out some more submerged points like this one. Maybe they all would have been good, maybe just a few of them would have been. Either way, it's an idea to keep in your bag of tricks for the next time you visit the lake. The presentation was nuthin' fancy, 1/8 ounce jigs tipped with 3 to 4 inch minnows. Fatheads, Shiners, Rainbows, they would all work. I think the correct size it what matters the most. Fishing Report September 8, 2012 Jeff Sundin - Since I allowed myself a little extra sleep this morning, I'm gonna give you the quick rundown. Nothing changed from Thursday, so read yesterday's report too and I'll be adding info as the conditions continue to change. On Friday, we managed to pick up right where we left off from the day before. Surface temperatures had already dropped, 67 to 69 was the range we found. Cooler on the calm side and warmer on the breezy side. We returned to the last spot first, Crappies were in the same location as Thursday; Ready, willing and able! After that, we did some jigging and found a very scattered, but still willing mixed bag of Walleye, Perch and Northern Pike. With a strong wind from the Northwest, we got pinned into the calmer side of the lake, but where there was a good drift, there was action. Six to seven feet of water on the weed edges. 1/8 ounce jig and minnow was the only presentation we used. Fishing Report September 7, 2012 Jeff Sundin - Another step toward fall feeding patterns WAS revealed on Thursday. When Crappie action went into hyper-drive and Walleyes shunned the "old reliable", night crawler in favor of the jig and minnow. After meeting the crew, and having a chat. We'd decided to try some fresh water for Walleyes, partly to cut down on drive time, partly to try and find some fresh spots to fish and partly because I needed a good spot to cook lunch. When we got to the lake, it was sunny and the surface was like a mirror. There was a heavy green algae bloom, but that was part of the reason for coming. The heavy bloom was supposed to help us defend against the high, sunny sky and calm conditions. But by the time we got on the lake, everything started changing. I don't think we ever even wet a line before it clouded up. Then it started to sprinkle and then it got breezy. I'd fished a few spots already and was getting nowhere in a hurry. I had become a little frustrated, I was second guessing my decision and rightly so. You know how these stories go though, just like the movies. I used those famous last words; "It's pretty slow, looks like we'll be switching lakes". But first, lets just try one more spot. A shallow point where rocks and heavy cabbage weeds meet, this spot could have anything on it, I said. In about a minute, I stumbled into something special; I looked over and Phil was reeling in a nice slab Crappie. I slowed down and backed the boat over the spot again and Phil had another, and then within a couple of minutes we had 7 Crappies. They were on the bite and within an hour, we were on our way back to the landing. Prepared to cook lunch with a cooler containing our limit of the hefty slabs. After lunch, we decided to try again. 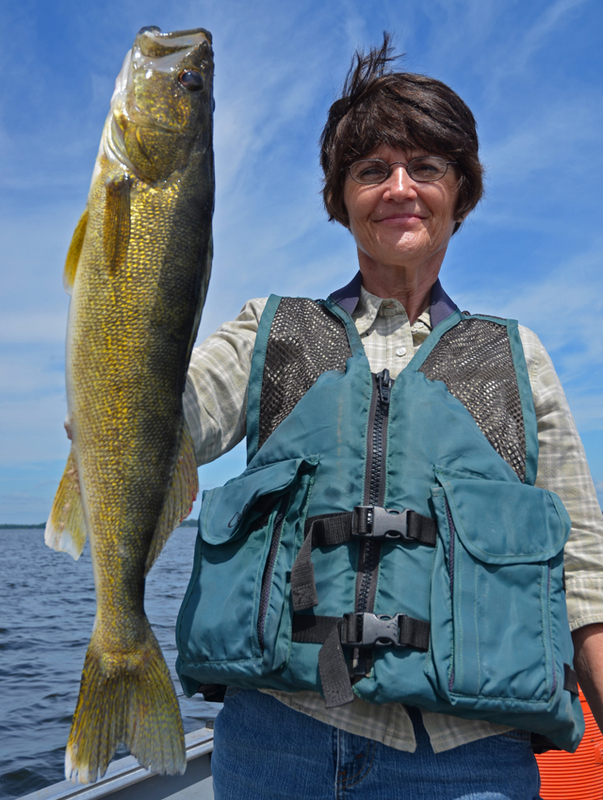 Another new lake, renewed enthusiasm and high hopes that Walleyes would be cooperative. At lake #2, surface water was 70 degrees, there was a havy bloom here too, but the West wind had stirred up a nice drift. At our first spot, a shallow point, with a heavy patch of Cabbage weeds on the top. 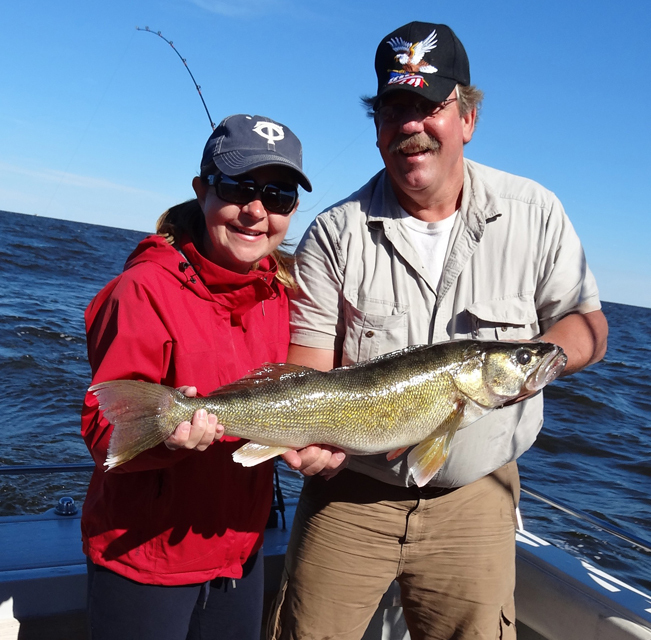 Kim dropped in his jig and minnow and pulled out two nice Walleyes. It looked like we were on Green for go, but subsequent drifts never produced another. After a few more spots, he got another nicer Walleye and for him, the trip was made. As it got later and the sun dropped in the sky, there was a pickup in the action but the fish ran really small, too small to add to the bag. The most intersting thing about the experience, was that Walleye completely snubbed the night crawler that I was using. After a couple of hours, I finally got smart, switched to a jig and minnow and almost immediately started getting bites. Even if the fish were too small, and even if I missed a few, there was a definite preference for the the jig/minnow. We never caught a fish deeper than 12 feet and the geography they like was shallow watrer points with weeds on them. If I was starting again this morning, I'd fish every small point on the lake, hoping to scrounge a fish or two at each of them. I'll be expanding on all of this, but right now, I've got a hectic day ahead of me. An early start, lots of fishing and then an important special project to work on this evening. Watch for more as we work our way through the weekend. 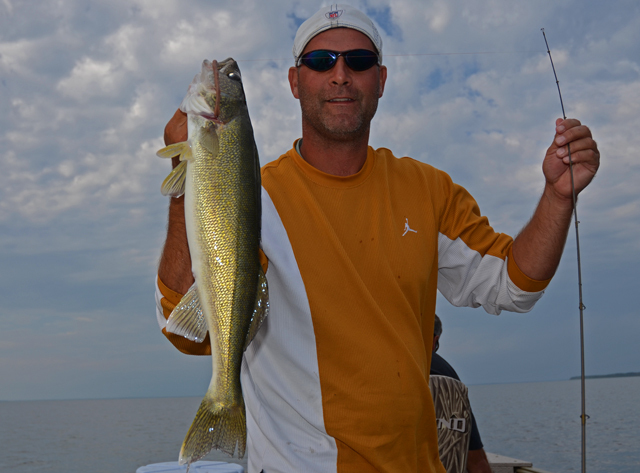 Fishing Report September 6, 2012 Jeff Sundin - Early signs of the fall Walleye patterns emerged on Wednesday as strong West winds delivered cooler temperatures to the north land. For those of us who were keyed in Lake Winnie's weedline Walleye pattern, that wind put an end to fun. Luckily though, it forced us to do some searching in new territory. We spent our day fishing Cutfoot Sioux and did the classic mixed bag trip. First we fished for Crappies and then for Walleyes. For me, catching the fish was a bigger struggle than finding 'em, but by days end, we had what we needed. The panfish have moved out, away from the weed edges just a bit. In fact, we probably could have still cast our jigs up into the weeds if we'd needed to. 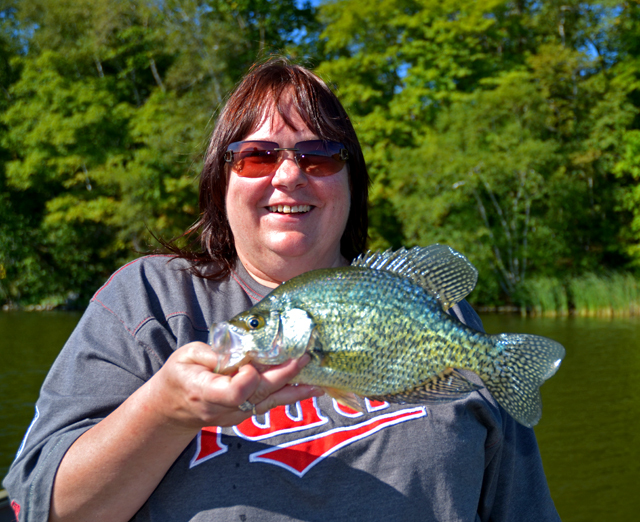 The mix of Crappies and Sunfish were holding in about 17 feet of water and were located near each other. Crappies were about 5 feet above the bottom, Sunfish were within a foot or two of the bottom. When they get all mixed up like this, I typically use cut pieces of Night Crawler for bait instead of minnows. That way, you have an equal chance of catching either Crappie or Bluegills. On Wednesday, that presentation happened to work better for the Crappies than it did for the sunnies. We did catch a few, mainly smaller size, but the action was heavily weighted toward the Crappies. The Crappies also responded quite well to the 2 inch Shad bodies that I've been using for the past couple of weeks. The presentation with the plastic tails is to lift the jig up about 4 feet above the fish and then let it free fall into the school. Watch the line as the bait goes down, if it stops, set the hook. After we did what we could with the panfish, we started our search for Walleye and found handfuls of fish in a variety of locations. Key depths were 10 to 14 feet and fish were located on weed edges, sand points and even on a couple of the lakes, smaller sand humps. It was the first day that I'd seen the fish show a preference for jig and minnow combinations instead of night crawlers. The problem was that they weren't hitting aggressively and we missed most of the fish that struck our lures. In the end we switched back to the jig and crawler combination, got less strikes but had better success hooking the fish. The surface temperatures on Wednesday remained in the 71 to 72 degree range, but with a cooler night and a cooler day predicted for today, I'm expecting to see water temps in the high 60's before this week is over. As the water cools, the trend toward jig and minnow fishing will improve and so will the action. Polish up your gear and get ready, the next few weeks promise to offer some great opportunities. All ya gotta do is get out there! (9/6) In the Bowstring Lake Area Otters Guide Service, Robby Ott Says; "In the past week I have fished Sand, Little and Big Jessie, Turtle, and Winnie.The results are mostlly the same,still finding fish on the weedlines, dont forget to check the inside of the weed line(if possible). Have had success on all lakes with spinners, lindys and jigs, combo'd with crawlers and chubs. I have some openings if anyone is interested. It's only going to get better from here on out. Have not found any major schools of panfish, that is just a matter of time my friends. Water temp is in the low 70's, looking for something in the 60's, then we will be in for a treat." - Good luck and be safe. I still have some dates available, Contact Otters Guide Service . (9/6) Gus Sheker, Gus' Place Resort on Ball Club Lake; "Surface temperature on Ball Club lake has slipped to around 70, aquatic plant and algae growth has stopped and in our harbor there is an obvious retraction of plant growth as the lake cools toward Fall temps. Fishing patterns and fish locations are also changing with larger Walleye moving into 8 foot shallow weed lines. Anglers are having good luck on Lindy rigged Crawlers drifted or slow trolled along the top and at the edge of the weeds. Rapalas are also picking off Walleye at this time. Leeches are also working on Walleye when you can get them at the bait shops. 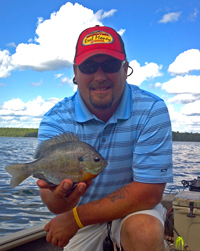 Northerns and Perch have been aggressive on the Southwest end of the lake in 8-9 feet on the sand flats. Some anglers are sticking with spoons while others are fishing Northerns drifting live sucker minnows & spinners. Perch are schooling in large groups in the same area, they are willing to chase a variety of small baits or on the calmer days you can vertical jig with a bit of night crawler. Move around to locate the larger fish. Fish the Perch 6-12 feet. The larger Perch are not as close to the bottom as the smaller ones. Lake level has gradually dropped, but water level is still good". - Gus Sheker. Gus' Place Resort . 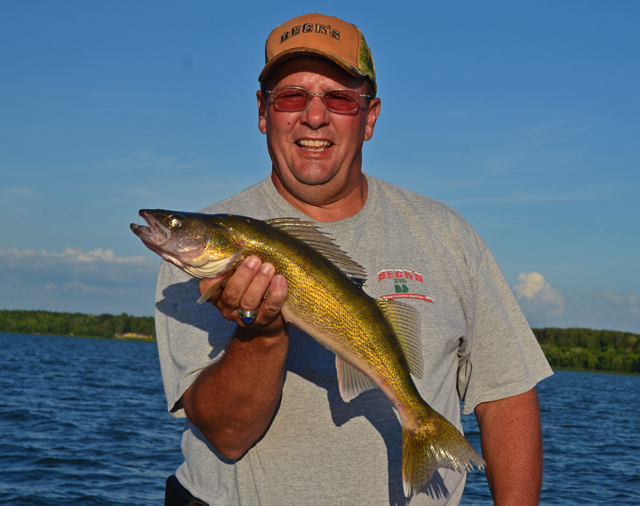 (9/6) On Bowstring Lake, Bowstring Shores Resort, Darv Oelke says; "Walleyes are back biting in the 7 to 10 feet along the north east shore. There is still some crappies being caught down at the rock pile 7 to 10 feet about 4 feet down. As it is staring to cool the bite will only get better." (9/6) Grand Rapids Area Fishing Guide, Jason Green Checked in and says; "Winnie continues to put out good numbers of Walleye. Even mid day continues to be strong. It seems the only time it lets up is when the wind dies down. For the past several weeks water temps have been up and down from 80-64 degrees but as of yesterday we were back up to 75 degrees. Pulling blades still is producing well. Hammered Green, Sunrise and Perch have been working for us tipped with a crawler. Working weeds in the 8' range at 1.1-1.5mph seemed to be triggering more fish. Pulling cranks in the same area is also still producing fish. #4 Hornets (Viking & Holographic Perch) ran in the same areas at 2.5mph is a sure winner. - Good luck this Fall, its about to get crazy". - Jason Green >> Upnorth . 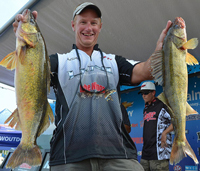 Fishing Report September 5, 2012 Jeff Sundin - Walleyes tucked back into their weedline patterns, but on Tuesday, they sure took their sweet time. When we arrived at Lake Winnibigosh, the threat of rain had all but disappeard, the sky was mostly sunny, the water temperature was holding at 71 degrees and there was a light ripple on the surface. Not exactly the recipe for the flurry of fall fishing action that is soon to be heading our way. We'd hoped that the weedline fish that kept anglers busy over the weekend would be there waiting for us, but today they weren't. They had either hunkered down in the weeds, or maybe they moved out for a while, either way, we weren't catching them in the weeds. Hoping that the fish had just slipped out accross the flat and onto the breakline, I made a move out to deeper water and discovered a ton of suspended fish, baitfish and minnows. The screen of my Humminbird was lit up like a Christmas tree. We Dropped in Lindy Rigs, two tipped with Night Crawlers and one tipped with a large Creek Chub. It didn't take very long before we'd had a few "slot-fish", one keeper and a couple of good hits on the minnow. It looked like I had found the Golden Goose, but then it just fizzled out. I'm not sure why, it just did and it didn't matter how many more deep water spots I tried, it was just plain over. Okay, so we headed back to the weedline, prepared for the long, hard search for a handful of fish, but this time, they were there. I took a little poking around to find the right spot, but once we did, it was good. By days end we'd capture or limit and release another 8 or 9 slot-fish, plus a couple of small ones. For us, the Sneaky Pete and Crawler combo was the magic trick. Fished in six feet of water, in or near the heavy weeds, the light jigs wiggled their way to the fish. Down the shoreline though, a friend was fishing the same pattern, but doing it his own way. He backtrolled the shallow weeds using spinners tipped with minnows and when we stopped by his boat at about 4:45, they were only one fish short of their limit. I'm guessing they got it and I'm guessing that there are a few other ways that you can catch them too. A side note, it seems that there are more Perch showing up in these shallow weeds too, some of them are larger than we've seen recently and I think it might be time to expect an above average run of Perch fishing. It might not be a bad idea to start carrying a supply of Perch minnows, just in case. Fishing Report September 4, 2012 Jeff Sundin - Walleyes made a return visit to the shoreline on Sunday afternoon and we made it to the lake just in a nick of time. It was an odd day for me! They always are when I have a trip scheduled for the afternoon. For some reason, It takes me a little while to get a game plan going when I arrive at the lake. I get anxious while I'm Multi-Tasking the morning away, pondering the list of unfinished business and wishing I were somewhere else. It gets worse when I read text updates from friends who are already out on the lake. This time it got even worse, because while I was trapped on shore, doing chores, everyone else was having a great day on the water! Thinking that I might do a little exploring before meeting my crew, I rushed through my list, got the boat ready and showed up an hour early. Guess what? There he was, a guy, with his boat parked at the dock, truck parked on the ramp, boat battery removed and connected to his truck with battery cables. He said it had been five years since the last time he used the boat and was "surprised by the fact" that the battery was dead. Hmm... There might just be a better way to find that out, but okay; I left and drove to a different ramp instead. The delay wasn't really that bad, but it added to the sense of urgency to get my boat onto the lake. By now, it was almost time to find the boys, so I got the boat launched, made one quick drift on the weedline, then drove around to the resort, picked 'em up and headed South. I was on the phone with a friend who was still catching fish on the East side of Winnie, even as we spoke. I mentioned to the crew that it goes against my better judgment to try and chase down someone else's "Hot Bite". Somehow, I always wind up at the tail end of the action and but it sounded like we better give it a try. Guess what? Now it got even worse, all three of us were pumped as you can get, in a big hurry to get in on the bite. But we arrived just in time to watch the action fizzle out. At first, everyone was still catching fish and in spite of the fact that I really hadn't figured out the pattern yet, we caught a couple too. Soon though, the action faded and except for a couple of boats who already had the system really dialed in, the catching had stopped. Luckily, another friend had just returned from a different area, and mentioned that he thought there was a larger school of fish working that area. I fired up the boat, hoping for a "do over" as we made another couple of mile run. It took a little sniffing around, but this time things worked out better. A long stretch of weeds, scattered on the shallow flat, held good numbers of fish. Most of them were eaters, but there were a healthy smattering of larger, slot-fish too. The pattern was; That there was no pattern. Everyone out there was doing something a little different. One boat was doing well using spinners tipped with minnows, another outfit was crushing them with Lindy Rigs and Night Crawlers, one fisherman was catching them on a jig and minnow. Then there was us guys, trying a little bit of all of it, enjoying a few hints of success, but still trying to hit the mother lode. Until I got a little bit stubborn and pulled out my own confidence bait. The 1/16 ounce Sneaky Pete, tipped with a night crawler has been catching fish for me all summer. Why should today be any different? Well it wasn't, after I tossed in my jig/crawler, I didn't go 50 yards before my first pick up. In a short time, all of us were using them, all of us were catching fish and I'm sure that all of us have our own theory about why. (9/4) Zach Dagel, Grand Rapids Guide Service; Has been having his best action in shallow water weeds. The crew has been rigging night crawlers in 6 feet of water. It's a simple but effective presentation that's putting a lot of fish in the boat. Zach says that the key to his success on Monday was ..... click here >> Read Complete Grand Rapids Report . (9/4) Targeting Smallmouth Bass from the bank, is one great way to enjoy an afternoon of action on the river. 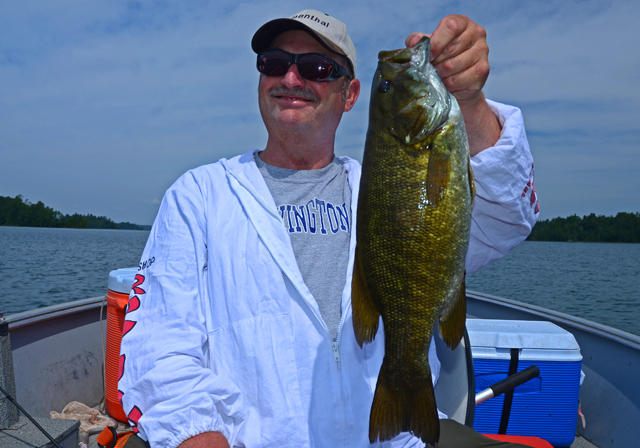 Jon Thelen shows just how easy it is to catch Smallmouth on Buzzbaits and poppers. It's on This Week right now, just click to view >> Targeting Smallmouth Bass From the Bank . September is here and our fall pricing is in effect. It’s a great time to save a little and enjoy world class fishing. Future Lund Boat Captains "Keep Score" - Frazee, Minn., boys capture International Angler Young Angler Championship title. New York Mills, Minn. (Aug. 28, 2012) – Aspiring lads begin their baseball careers with t-ball. Lots of hits; errors galore; and nobody officially keeping score. (Although you can bet your last minnow that the naturally competitive kids always know the tally, as do their parents.) Angling follows a similar path. At first, kids learn how to minimize tangled lines and keep flying treble hooks away from flesh. Naturally, the next step is keeping a mental fish count, waiting for the day you beat “the Old Man.” And finally, if competitiveness is in your DNA and the passion of fishing is in your blood, you begin testing the tournament world. Fast forward to today, and you have the winners of the 2012 International AYA Tournament in Kenora, Ontario. Young anglers Jacob and Ryan Roble, along with adult angler Craig Jindra, were guided by Lund Boats Pro Staff Cary Pettinger and spotted up a cumulative walleye weight that’d make the toughest tournament veteran cry – six fish for an all-time tournament high of 53.25 pounds. (Yes, that’s an average of just under 9 pounds apiece.) And as you’d expect from young conservationists, all of the fish swam peacefully back toward the bottom. The grand prize was befitting for red blooded North American kids, too. The Roble boys are “Going to Disney World!” – quite literally, for four days and three nights. The Roble brothers, who were sponsored by Hoot’s Sport in Perham, Minn., qualified for the international event by winning the AYA Regional Championship in June. Second place finishers, Brian and Brady Paul with adult angler Ross McVey, who were guided by Lund Boats Pro Staff Blair Dingwall and weighed 42.58 pounds of walleye, won a guided fly-in fishing adventure trip for four at the Wilderness North Lodge in Canada. The Pauls, who were sponsored by Power Sports in Abrams, Wis., qualified for the event at the AYA Regional Championship in Green Bay in June. Pardon the pun, but these kids are clearly “hooked”… and will continue keeping score in a competitive world. About AYA - Started in 1998, Angler & Young Angler (AYA) fishing tournaments were established to guide enthusiastic anglers into the competitive fishing realm. AYA’s priority is to educate and introduce youth to competitive fishing with the help of friends and family. 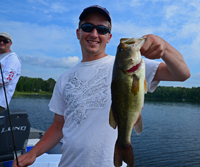 Teams consist of two young anglers and one adult angler. AYA Events consist of a full day of fishing followed by weigh-ins, prizes, awards and a BBQ. Top winners are invited to fish in an international tournament. AYA tournaments are throughout the continent, holding 18 annual events across North America. 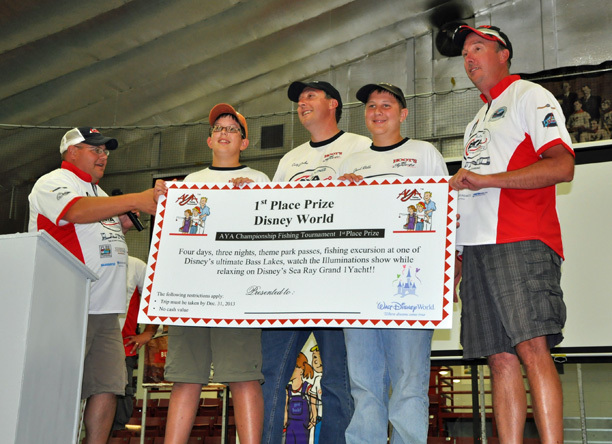 This year the International Championship was held on August 25th on Lake of the Woods in Kenora, Ontario. Learn More >> Click Lund Boats AYA . (9/3) On The Iron Range, From Greg Clusiau "... a recent day on Big Winnie, with David Holmbeck, my son-in-law, had us catching a nice limit of walleyes by trolling spinners in and around the cabbage beds. It wasn’t fast fishing by any means, and it took a while to find an active school of fish, but once we did locate them, it was slow but fairly steady action. I showed up to fish with David, armed with only one spinning rod that had my favorite spinner tied on. No tackle box, extra spinners, nothing. I was (so confident) in the spinner that I ... >> Read Greg's Full Report . (9/3) On Lake of the Woods, Border View Lodge, Mike Kinsella wrote; "Once again, fishing was fantastic this week. Plugs are still working well in the deep water, but there are definitely signs that the fish are starting to move in. The live bait bite has picked up significantly. The west shore near Zippel Bay has been good. The action has also picked in 24 to 30 feet in front of the gaps and Pine Island. Cooler nights have brought the water temperature down into the high sixties. Highs will hit 80 early in the week and then cool to 60s and 70s for the weekend. Fishing Report September 2, 2012 Jeff Sundin - Labor Day Weekend marks the first time I've been "Stood Up" this season. From my point of view, it's not very handy to be planning on working and then find out that the crew is a "No-Show". But, these things do happen and I guess it turned okay in the end. A mixed blessing for me, as the unexpected day away from the lake provided an opportunity to make another small dent in the backlog of cleanup chores still left from the July storms that hit hard around here. Everything from Logging to Chicken coops found their way onto the agenda and I was able to mange getting a few of them done. September 2 , 2012 - On Lake Winnie and Cutfoot Sioux - Breezy weather on Saturday gave Walleye action a boost on the big lake. But be ready, Cutfoot Sioux is getting ready to provide some good Walleye action too. The action began picking up a few days ago, and seems to be getting more reliable each time someone goes out. Fishing with spinners and Night Crawlers, Walleys are coming from the weed edges on points and inside corners located adjacent to larg weedy flats. The fish are moving in and out of the weeds so key locations change frequently, but anglers with the urge to explore, will be able to find some fish in Cutfoot right now. Panfish action, Crappies and Sunfish have gathered toward the weedlines too and guests are reporting good catches of ... Read >> Bowen Lodge Walleye fishing report . Fishing Report September 1, 2012 Jeff Sundin - Gorgeous weather, beautiful scenery and fair fishing offer anglers a nice compromise. High Blue skies and calm seas, dampened the action a little, but the fish offered just enough opportunities to keep the day interesting. On Friday, the game plan was a special one. The goal was to focus on Smallmouth Bass, but to also have a chance for some Walleye and maybe even a Musky. What's so special about that, is how few lakes there are that can provide an equal opportunity for all three of those species. There are a few though, and we picked one of them. At the ramp, the sun was just popping up over the trees as we launched the boat. The sky was bright blue and there wasn't a ripple on the surface. Not exactly a dream come true for someone planning to fish a lake with super clear water. But the crew was experienced and up for the challenge, the weather had been stable for several days and with a warm, 72 degree water temperature, we believed that at least some of the fish should be active enough to help make a good day for us. Hoping for some surface action for Smallmouth, the boys wanted to hit some shallow water spots first. We headed for a stretch of shoreline where deep weeds met shallow rocks. The combination is often the key to summertime Smallmouth and throughout this day, would turn out to be even more important than usual. At the first stop, we caught a handful of Smallmouth, but not on the surface. The poppers and other surface baits drew attention from a few fish, but the biters struck the un-weighted, wacky rigged Yum Dingers, fished a foot or so under the surface. Next stop, a hump with heavier weeds and a little rocks mixed in for good measure. The ordinarily reliable spot was holding small Sunfish, Rock Bass and a couple of Largemouth, but not much else. Another shallow, weedy point held a couple of Largemouth, but left us wanting for more Smallmouth action. We shifted our focus to some deeper water, checking mid-lake humps that topped off in the 20 foot range. It took a few stops, but I eventually lucked into one hump where a school of fish lit up the screen of my Humminbird. Here, we dropped in Lindy Rigs, mine tipped with a night crawler, theirs tipped with leeches. After a couple of circles around this hump, we'd boated three Walleyes, a half dozen Bass and missed a few more bites. Things were looking pretty good, but in the clear water, the bite fizzled out and we'd have to go prospecting some more. The next string of deep water humps weren't showing strong signs of life, but there was a little something at every stop. A mix of small fish, Bluegills, Largemouth and Baby size Smallmouth occupied some time, but it was clear that the Walleye action was behind us and it was time to go back to the Smallmouth fishing. The boys had a spot of their own that they wanted to try. Another shoreline spot with the weed/rock mix that had worked earlier in the morning. It was a great idea, there were definitely fish there, but by now the sunshine was high and bright. We could see the fish with our eyes and knew when they were sizing up our baits. We caught some of them, but the Lion's share were lazy and only about one out of 6 would take a bait. The ones that did showed a preference for a Carolina rigged 4 inch tube. We might have caught a few more fish on this stretch, but a Black Lab saw my Camo Alaskan, fell in love with it and literally swam with us all the way across the bay. Right through the rocks, the fish, the weeds and everything else. We had to turn around and get him to follow us back to the dock so that we could go back to fishing. The next few stops served to solidify our belief in the Weed/Rock pattern and just how precious those spots were. We could fish all the rocks in the world, but unless there were weeds adjacent to them, there were few, if any Bass. Likewise, we could fish all the weeds in the world, but without rocks, only small panfish, Rock Bass and babies were present. There were Smallmouth Bass on some of the deeper humps too, but for us, these fish were snubbing artificial baits and were strictly meat eaters. We caught several Smallmouth on the Lindy Rigs while we searched for Walleyes and it's likely that had we concentrated more on the schools of Bass that appeared on the Humminbird, we'd have caught a lot more. To sum it all up, if I was heading back there today; I'd bring the Yum-Dingers, The Tubes, The Night Crawlers and a bucket fill of small to medium size Creek Chubs. I'd tell you to bring some Leeches, but I'm afraid that I'd be sending you on a wild goose chase, because most bait shops are either already out of them, or soon will be. I'd limit my fishing to shoreline spots where there is a healthy mix of rocks and weeds. I'd limit my mid-lake structure fishing to humps and bars where I mark large numbers of fish. Forget the spots where you see three or four fish on the screen, there just aren't high enough odds to win that game. At least not right now. (!!) Smiles are always welcome! I AM! Good morning Mr. Smith. Okay, so this might not be his first Walleye, it could be the second. Either way, even physics teachers have a way of becoming believers. Ya just gotta work on 'em! For Dave Kosiarek, the 1/16 ounce jig and crawler combo kept the bait in front of the fish for longer periods of time. It worked like a charm! 2012 International AYA Tournament in Kenora, Ontario. 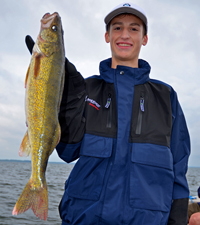 Young anglers Jacob and Ryan Roble, along with adult angler Craig Jindra, were guided by Lund Boats Pro Staff Cary Pettinger and spotted up a cumulative walleye weight that’d make the toughest tournament veteran cry – six fish for an all-time tournament high of 53.25 pounds. For me, catching Smallmouth is about as fun as fishing gets. The Wacky Rigged Yum-Dingers gave me more than a few reasons to smile! Largemouth Bass were in there too, Weeds mixed with Rocks were by far the best shallow water areas. Largemouth Bass kept the action going during our search for Walleye and Smallmouth. Click to enlarge: Some mid-lake humps had large schools of Smallmouth Bass. Some were mixed with Walleyes. All of them were meat eaters. We tied on 1/16 ounce jigs, clipped on the bobbers and added a medium size fathead minnow. Most of the fish were small ones. But every once in a while, WHAM! A good one. After 40 years, Humminbird has changed their iconic look with an updated logo! To see the transformation and for a ton of helpful videos about Humminbird, >> click to view. He's found 'em again this week and has the video to prove it and it's already loaded up. If you're ready to lean more about trolling for Walleyes in late summer, Play The Video . For Clark (below) and Paul (above) Smith, a happy reward for a day spent searching for fish. Crappie action in shallow weeds turned a bummer into a bonanza! Paul Smith with one of Lake Winnie's "Bar Fish". Lindy Rigs and night crawlers and fished in 15 to 19 feet of water produced a steady supply of Walleye on Saturday. Courtesy Four Seasons Resort: Joe Thompson releases a giant, 52 inch Musky caught by Phil Jensen on Sat. 8-25-12. This fish and a small group of friends were holding along a slight inside cut on the breakline. Key depth was about 17 feet of water. Lindy Rigs with air injected Night Crawlers worked like a charm. Larry said " I want to catch a big fish that jumps". Okay then, here ya go! This Pike hit a spinner on the edge of a mid lake hump at 16 feet of water. Jump? Heck yes, right straight out of the water! A mix of small, medium and an occasional large. Crappies are beginning to get schooled up. Best action comes on 1/16 ounce jig and minnow combinations, in 16 to 20 feet of water. It's hard to argue with success. Lindy's Purple Smelt color held some special magic on Wednesday and before long, we were all using it. Small packs of Crappie beginning to build along the outer edges of weeds, along steep breaklines. Small fish were the most common. But there were just enough keepers mixed in to make it worth spending time on the project. A blustery day never seems to stop the Pike! In fact, waves, rain and Grey skies help tip the odds in our favor. Melinda Hays shows off a Pike that fell for a Lindy Rigged Creek Chub. Courtesy Sportsman's Lodges; Garden Island and areas around Knight Island have been good for controlled depth trolling with crankbaits. in 30'-32' of water. Courtesy Traditions Media: Along with the Angler of the Year trophy, Chad Schilling received $10,000 from FLW and another $10,000 from LUND Boats. My 8th Lund Alaskan, rigged and ready to go. 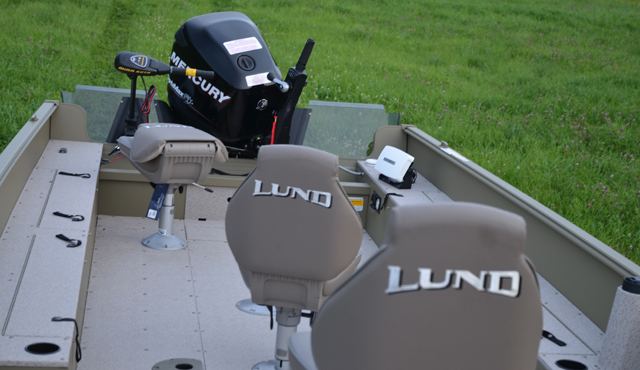 Lund makes a lot of great boats, but for me, this one hits the nail on the head! ALL BUSINESS! I know, it looks a little clean, in fact, it looks like you could eat off the floor! Don't worry, we'll get it trained in, there's a lot of fishing still ahead this summer! A little Bass style Walleye fishing helped coax Joy's 22 incher out of the weeds. Lilly Pads, Coontail and sunken logs. Maybe not the first place you'd look, but sometimes it's a good one! Readers know that I've mentioned using the Yum Dingers for Bass fishing a whole bunch of times. 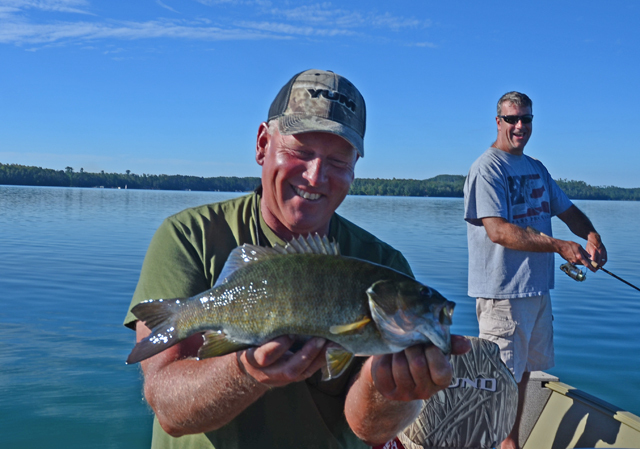 Now, if you want to see them in action, Click to view >> Late Summer Smallmouth Bass Fishing . Learn when and where to throw a frog or buzzbait as the conditions of the day change. You may be surprised at how effective these topwater tactics can be throughout the day. Click to view >> "Froggin' For Largie"
Even a tough day offers up a few highlights. Roger Hadley caught a few Walleye including this one that came on a Lindy Crawler Harness, Redtail color trolled in 8 feet of water. Nothing better than discovering your hidden talent as a Bass fisherman! This healthy Largemouth was caught on a small, 4 inch YumDinger rigged on a 1/16 ounce jig. Jig and minnow combinations were the only game in town for the Walleyes that we caught. Not huge, but perfect eating size, they were a welcome sight, as we caught them in between Rock Bass and panfish. Laurie Anderson learned a few new tricks on Wednesday and shows off the reward. She CPR'd this 26 inch Walleye using 4 lb test, a 1/16 ounce jig and Night Crawler. The combination has been good as gold this summer! It was a good day to be Oscar Pearson who took a little trip up the learning curve, got the knack of the Wacky Yum Dingers and then hammered down! Nice work Oscar! A gesture of reward for the effort, Turtle Lake gave John Pearson one nice Smallmouth, just to tease him into coming back. The fish were deep, this one came on a Lindy Rig in 30 feet of water. Casting Six Inch Yum-Dingers rigged Wacky Style into shallow water Bulrushes, was just what the doctor ordered. Warm Water Bass are hungry! Pike in the deep weeds, struck on a Lindy Crawler Harness while trolling for Walleye. Extreme topwater Smallmouth action! Jon Thelen shows you where to find summer time smallmouth and how to catch them when they're up on top. Would ya' look at that! After all of the talk, co-hosts of KAXE's Morning Show; Scott Hall (above) and Chad Haatvedt (below) teamed up with the Early Bird Fishing Guide for a day on the lake and they actually caught something! Even the Early Bird caught one! Oh and by the way, do you know that you can listen to the Radio Program on KAXE Live at 6:20 AM every Thursday? What? You can't get up that early, that's okay, just listen to last weeks show by clicking here . I guess that if you don't know the size of my hand, this picture doesn't mean a lot. But believe me, this is a nice one! Chris Andresen shows off a little of his handywork, a solid ten inch Bluegill caught on a 1/16 ounce jig tipped with a cut piece of night crawler.